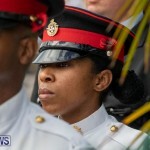 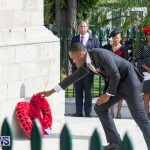 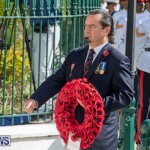 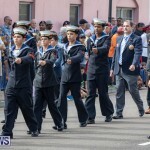 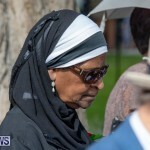 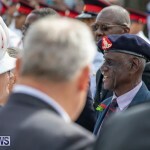 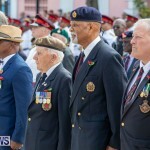 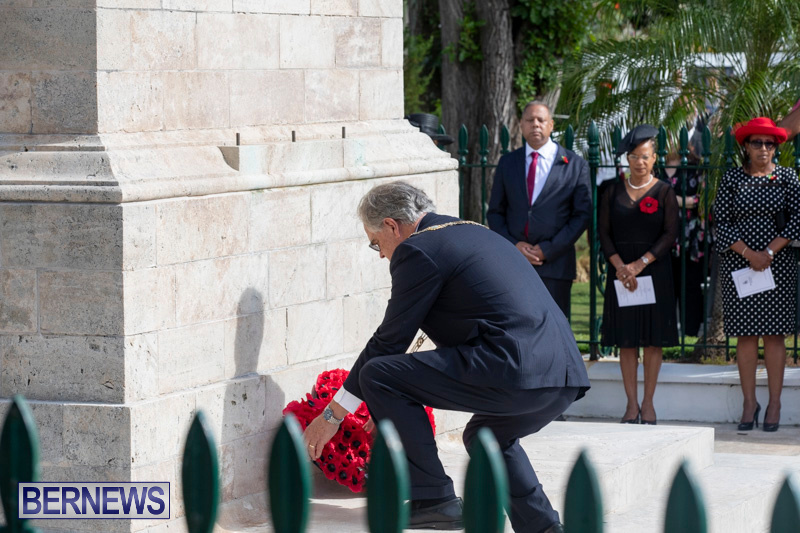 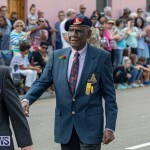 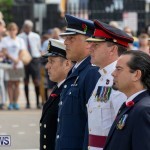 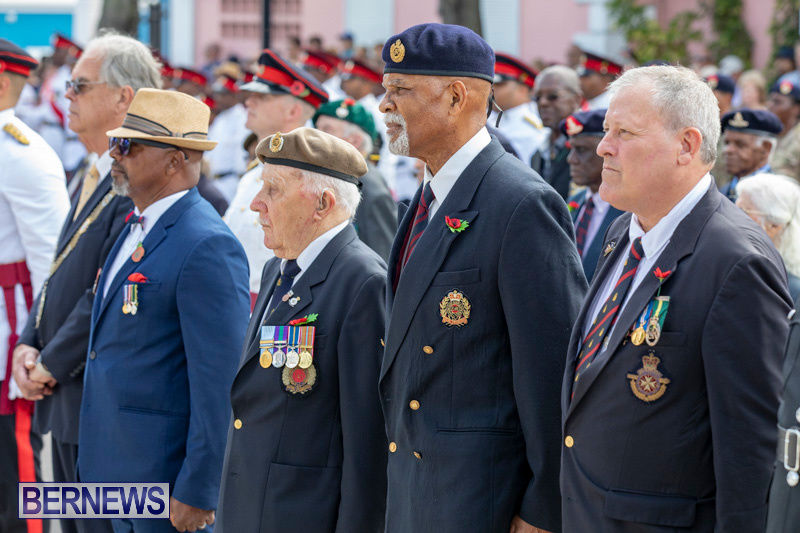 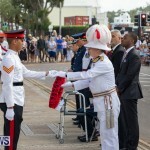 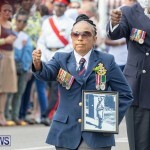 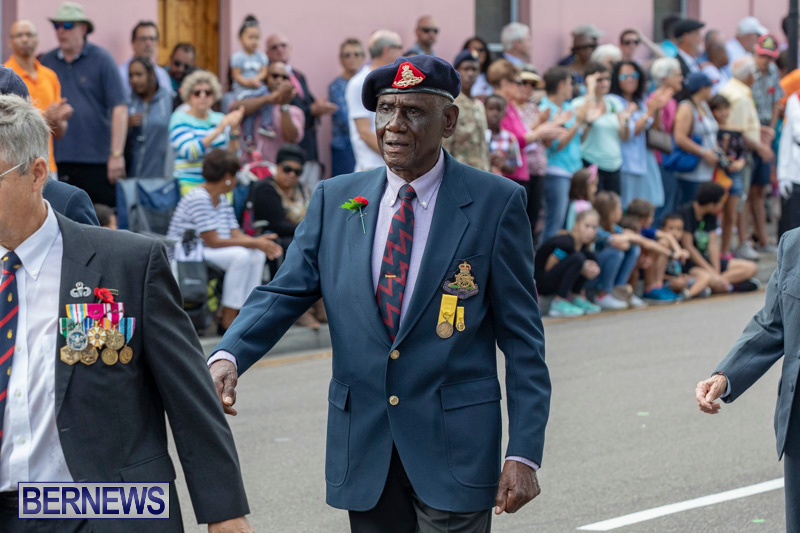 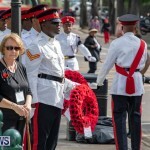 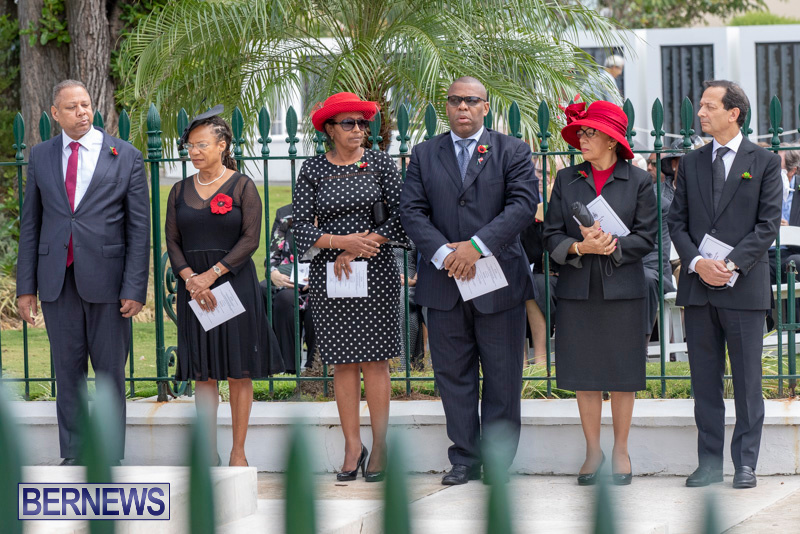 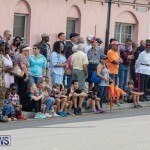 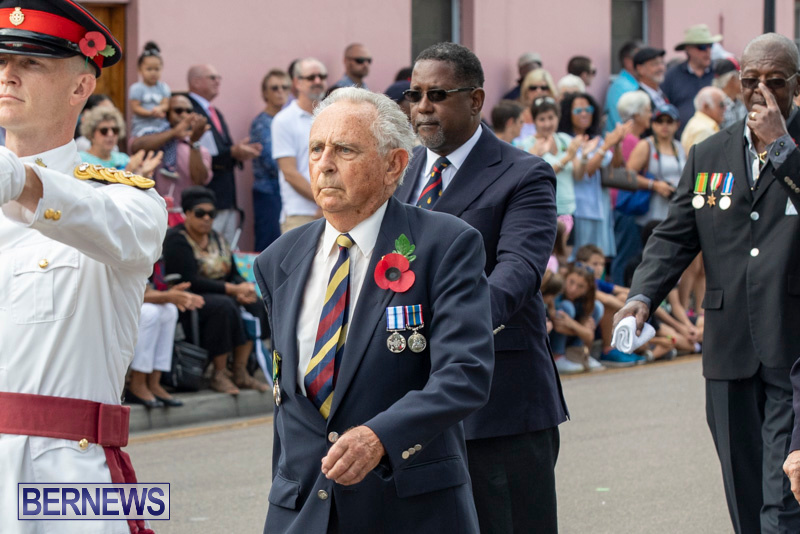 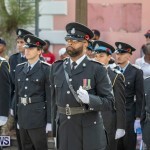 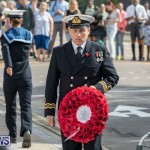 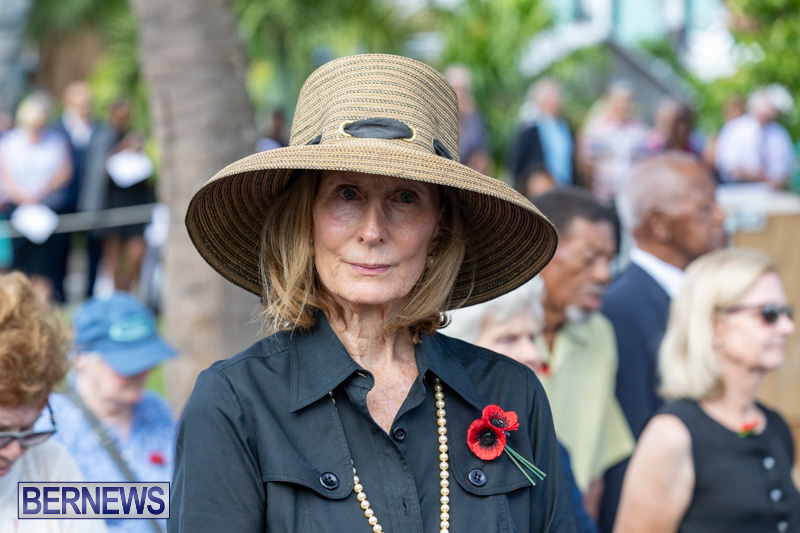 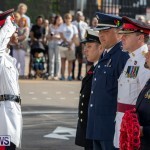 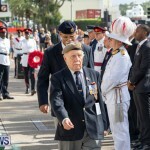 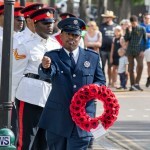 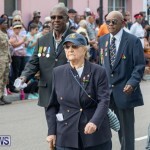 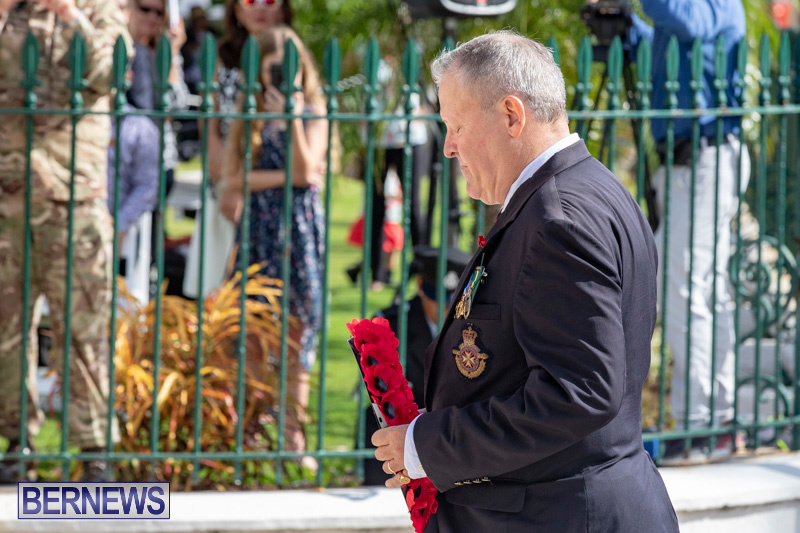 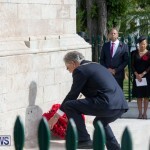 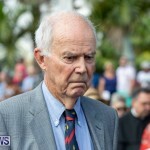 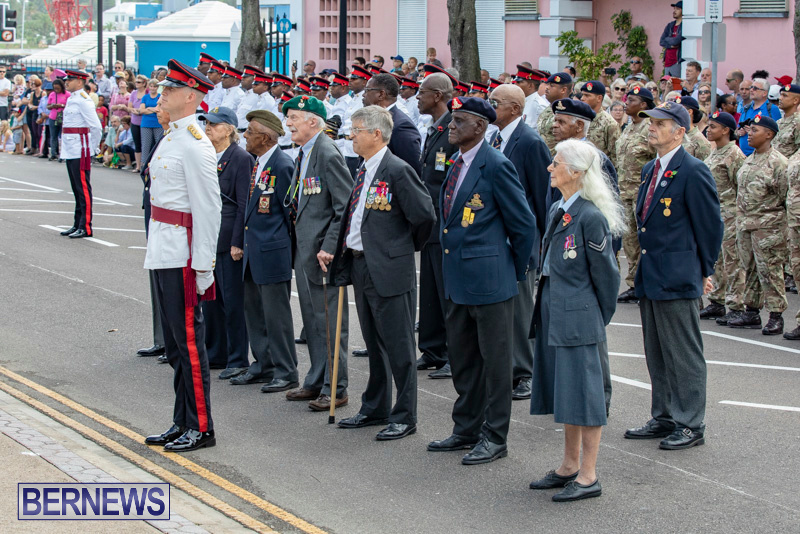 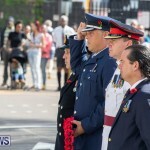 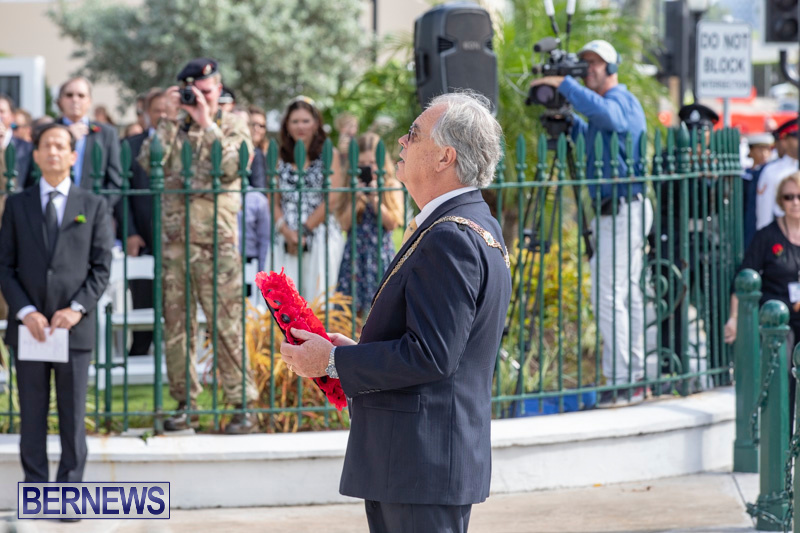 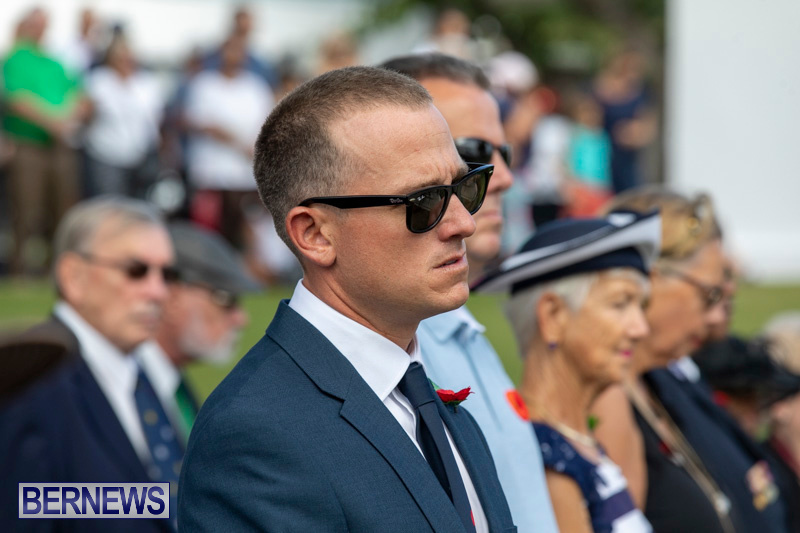 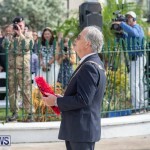 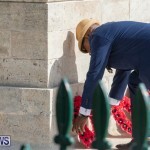 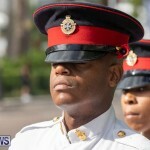 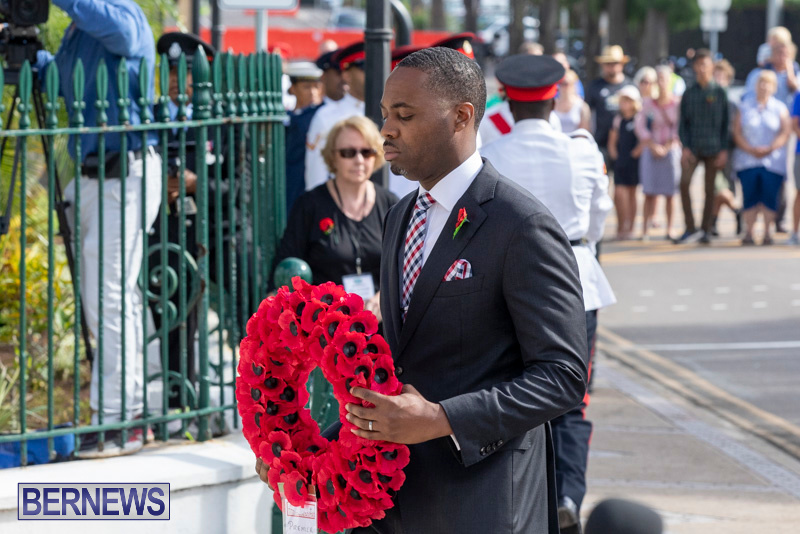 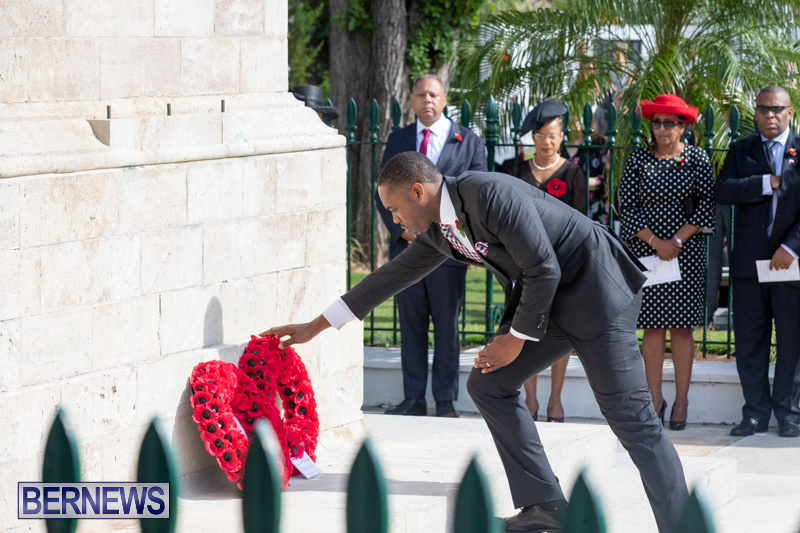 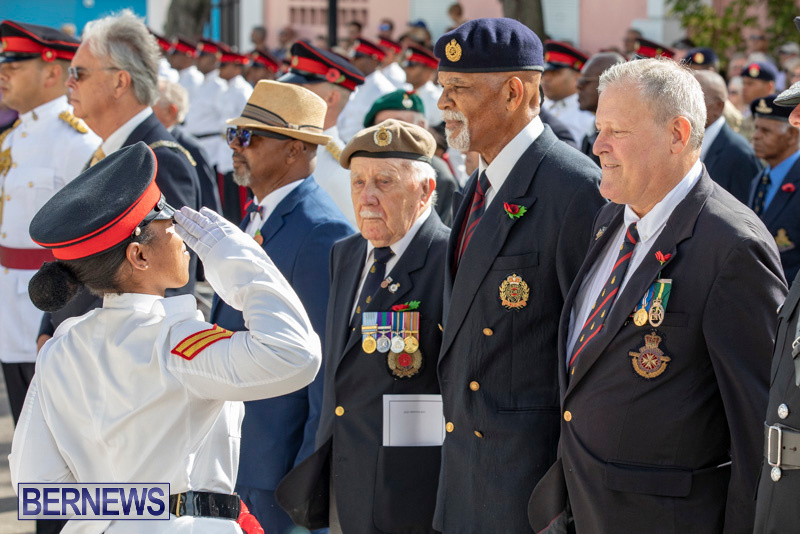 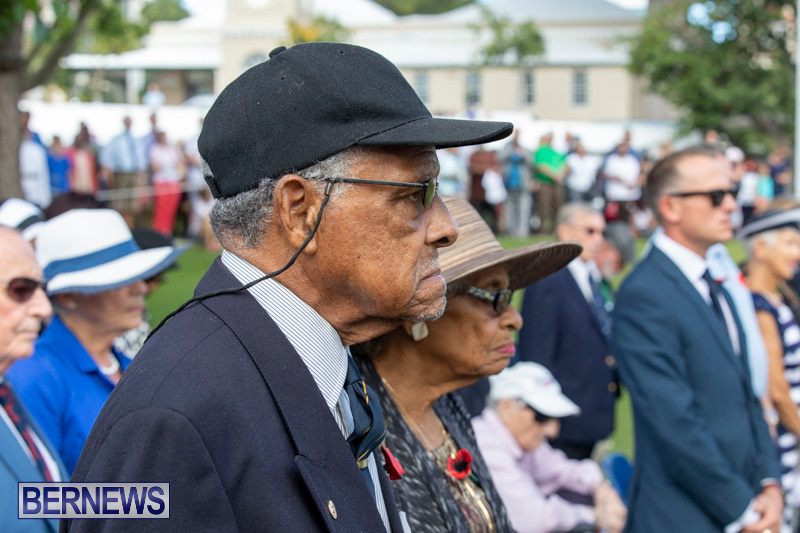 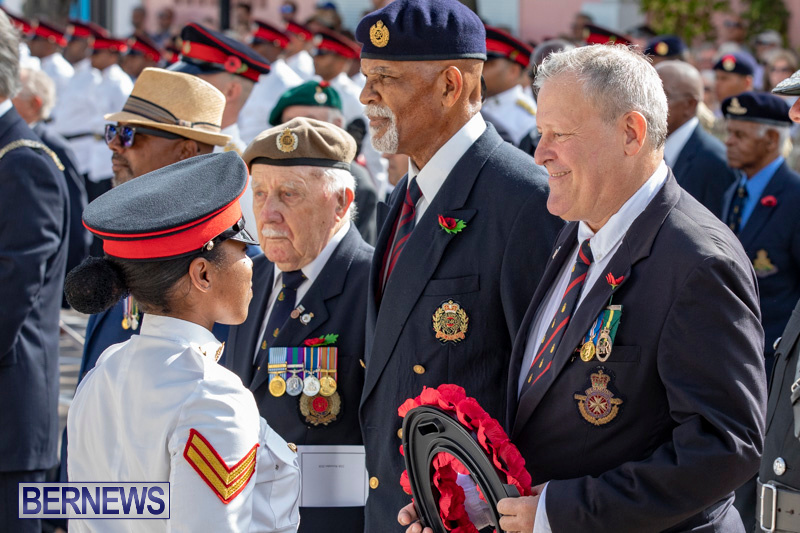 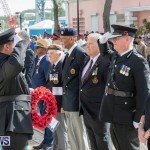 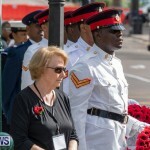 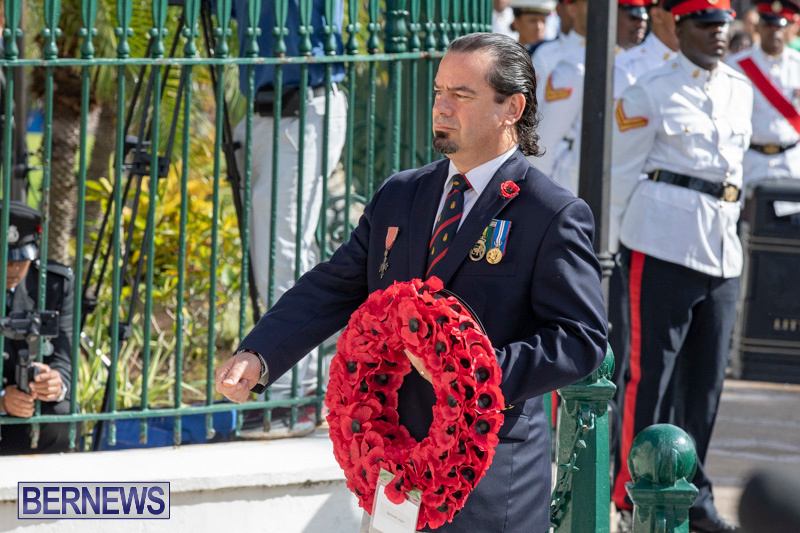 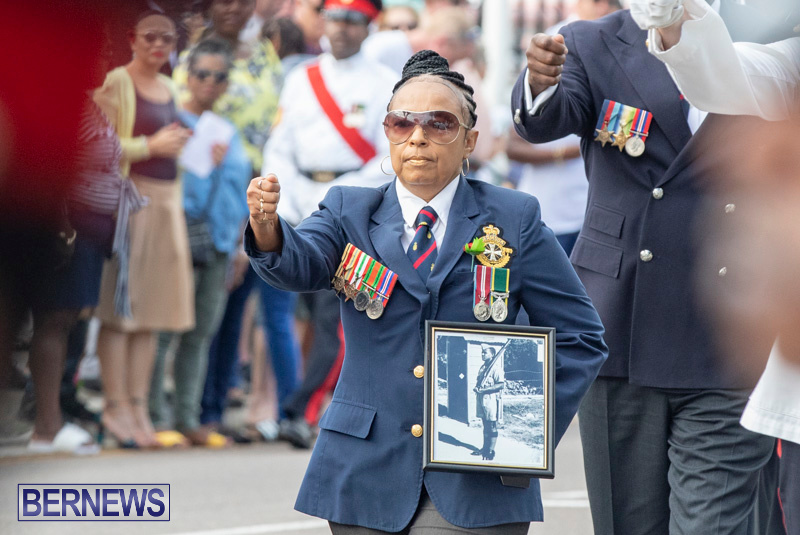 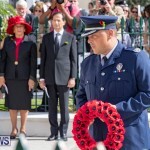 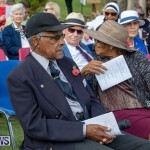 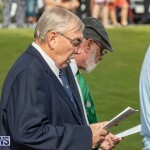 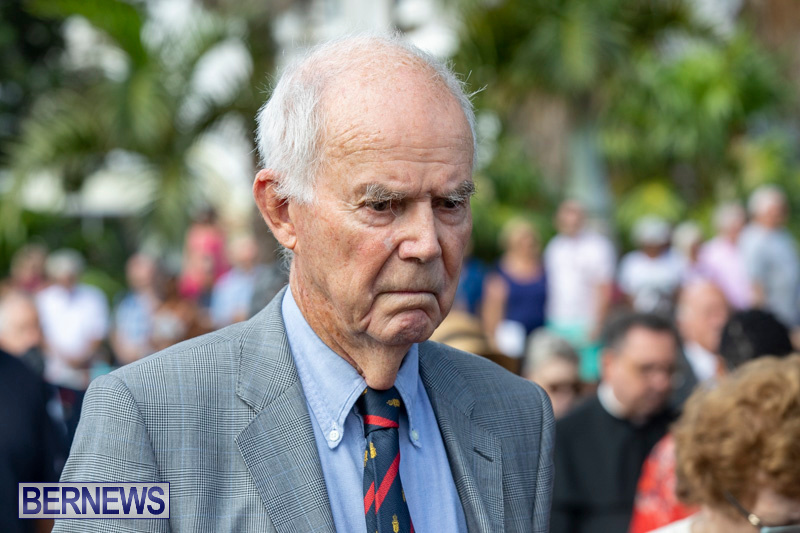 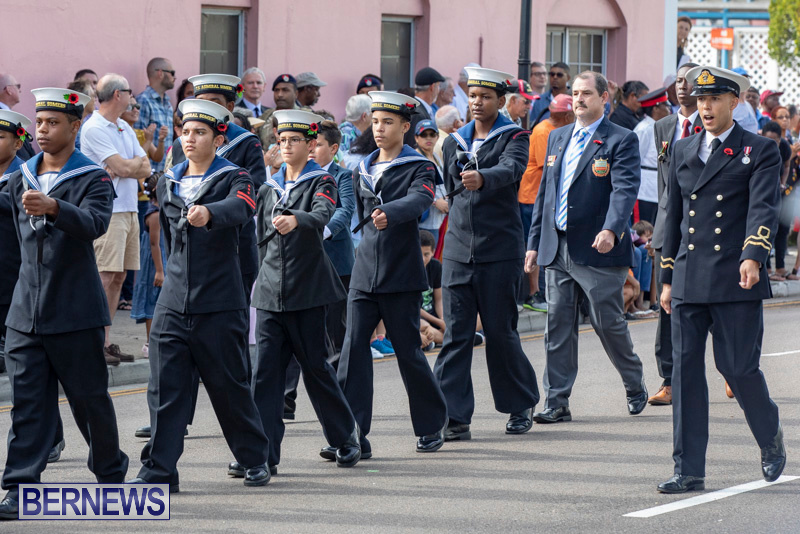 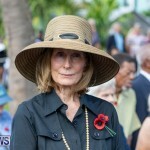 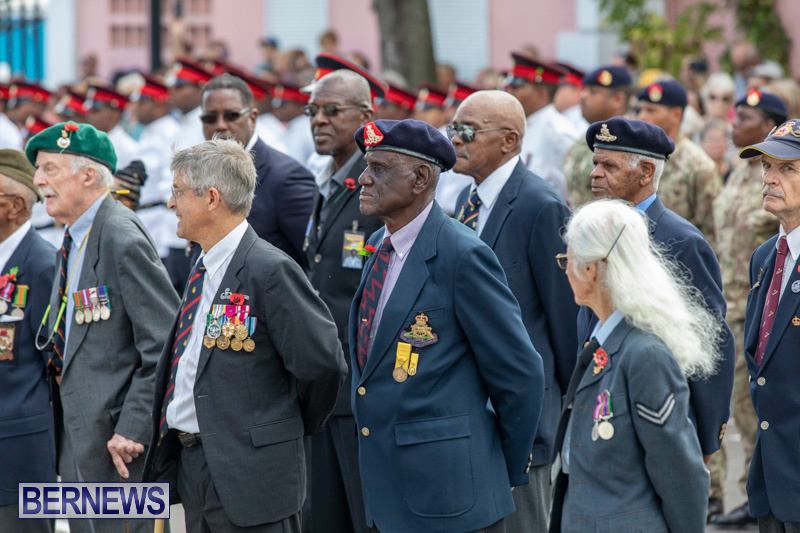 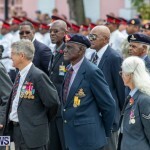 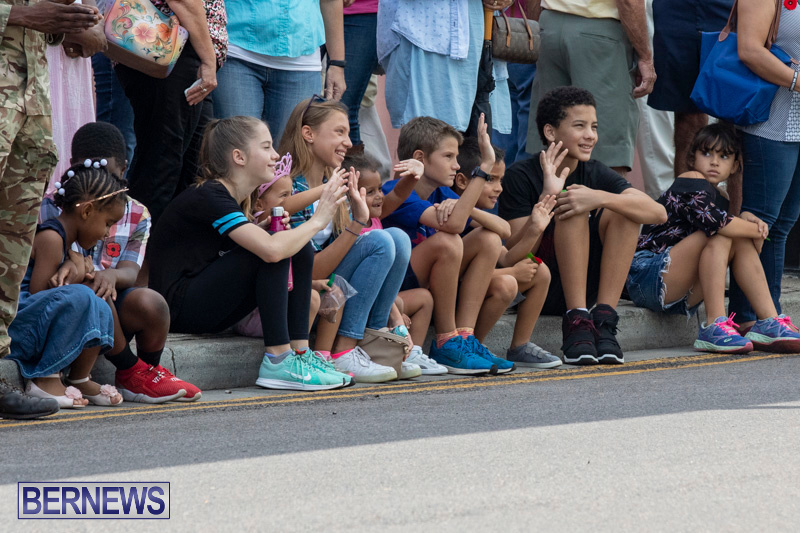 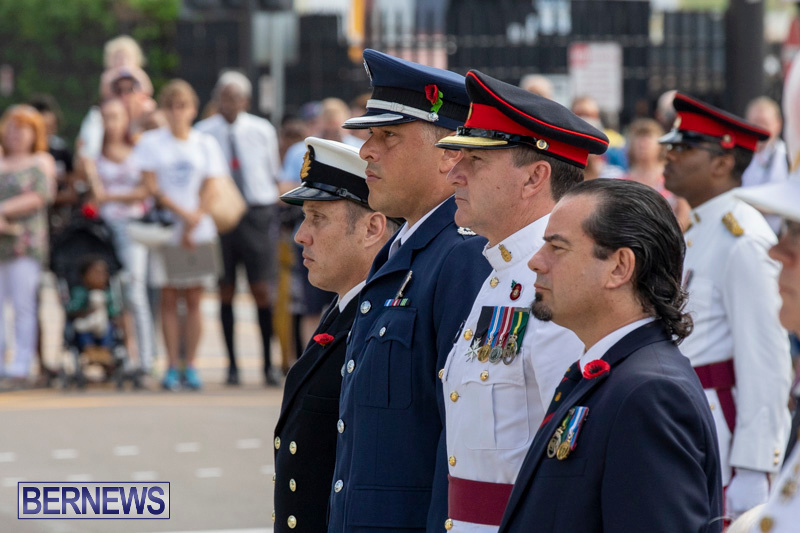 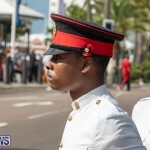 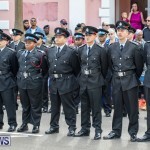 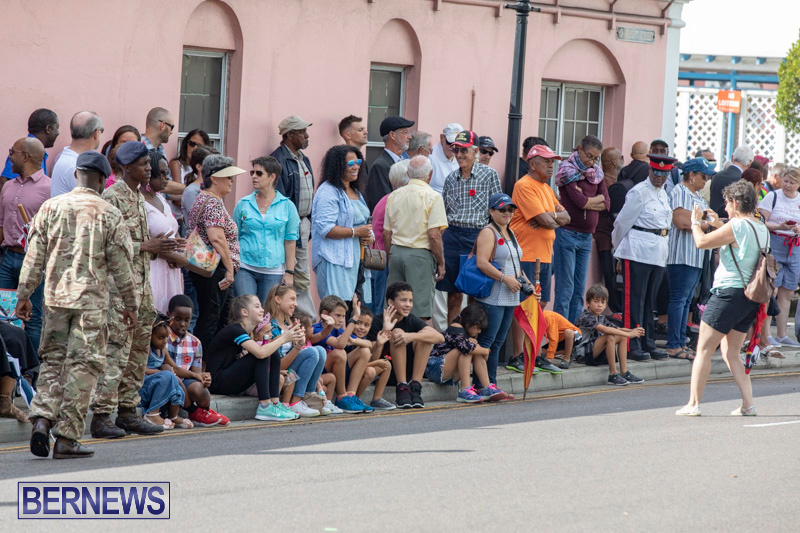 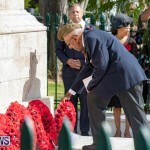 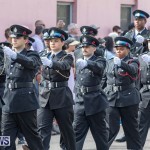 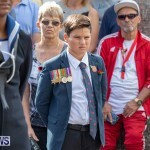 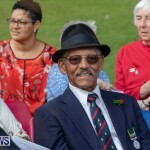 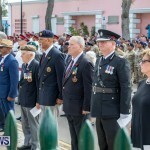 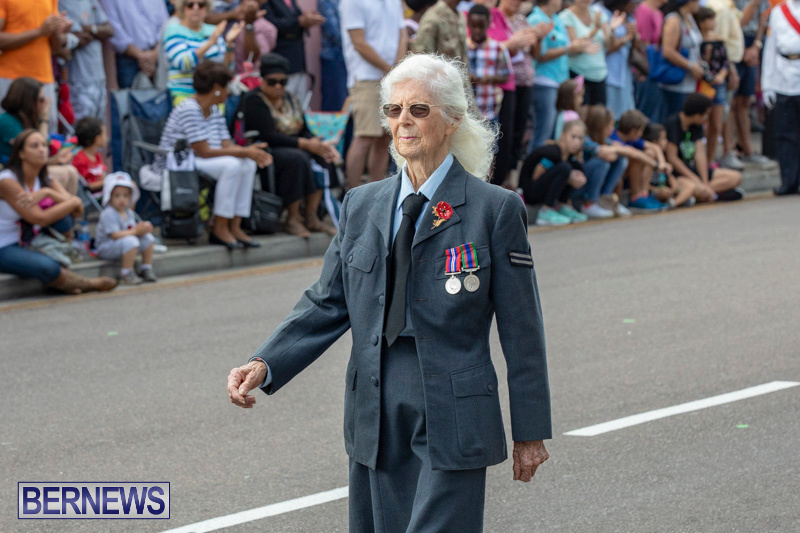 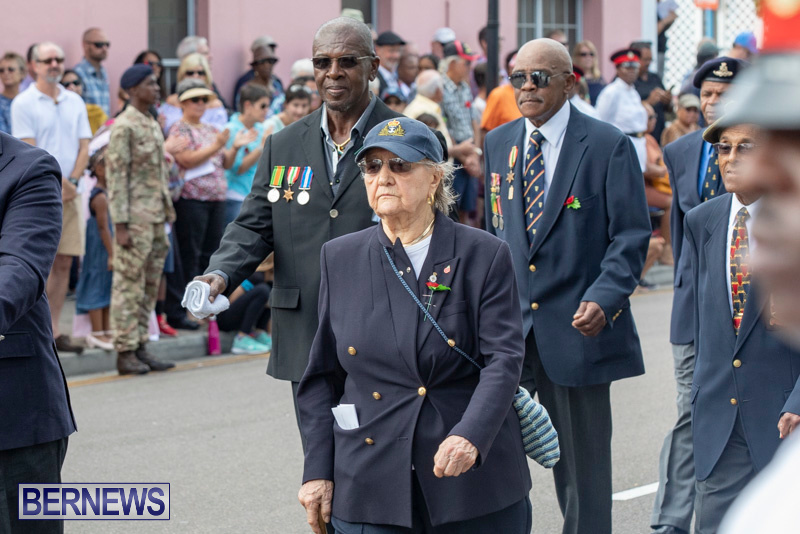 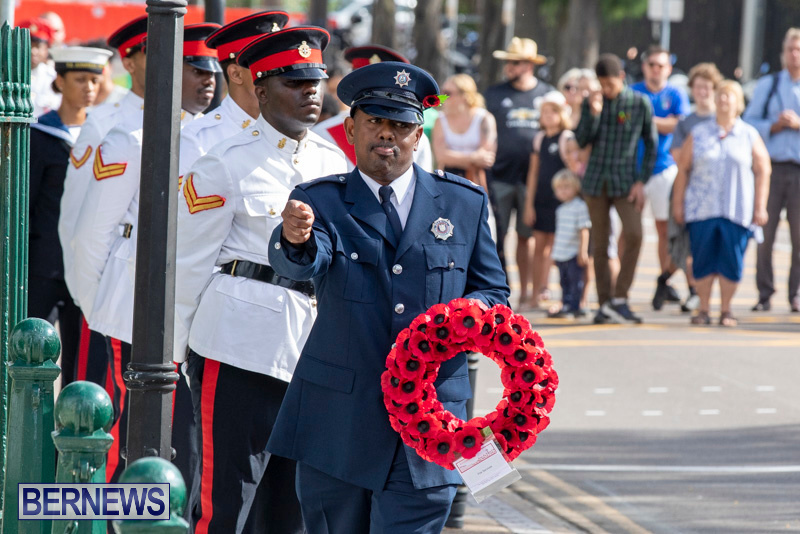 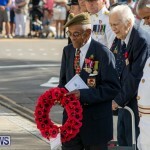 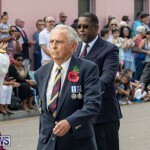 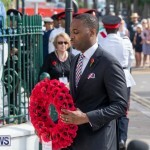 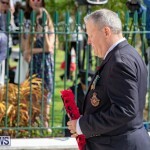 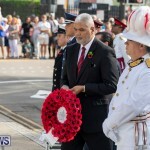 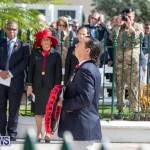 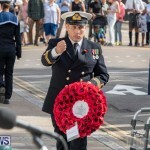 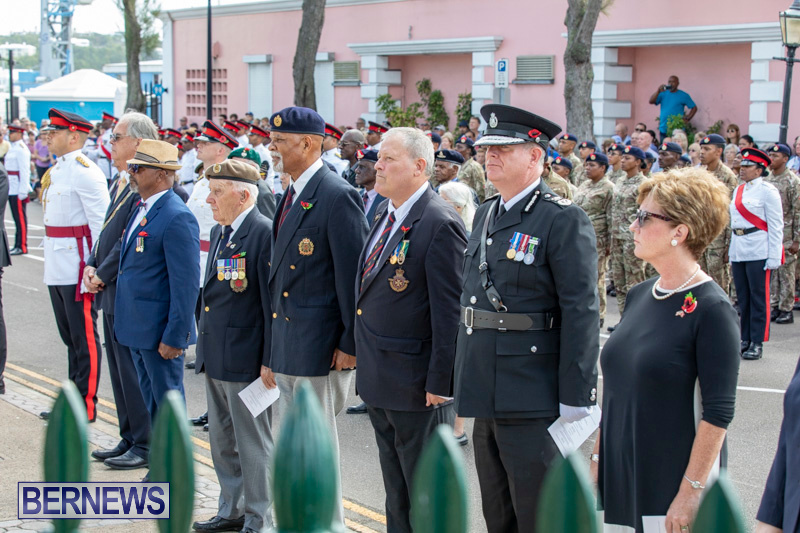 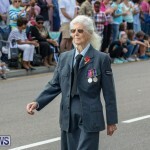 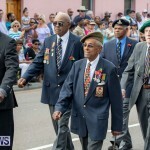 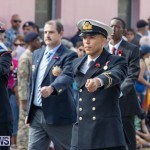 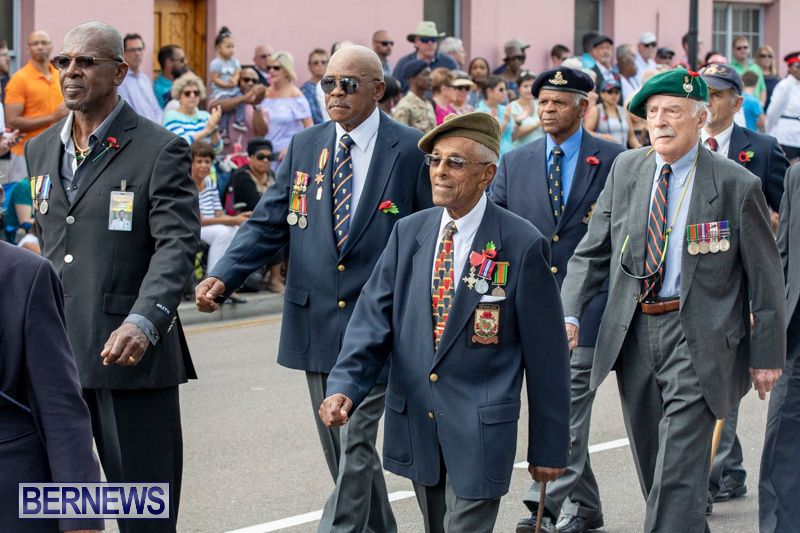 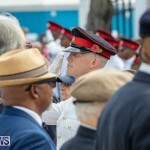 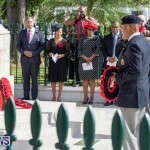 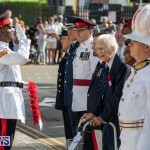 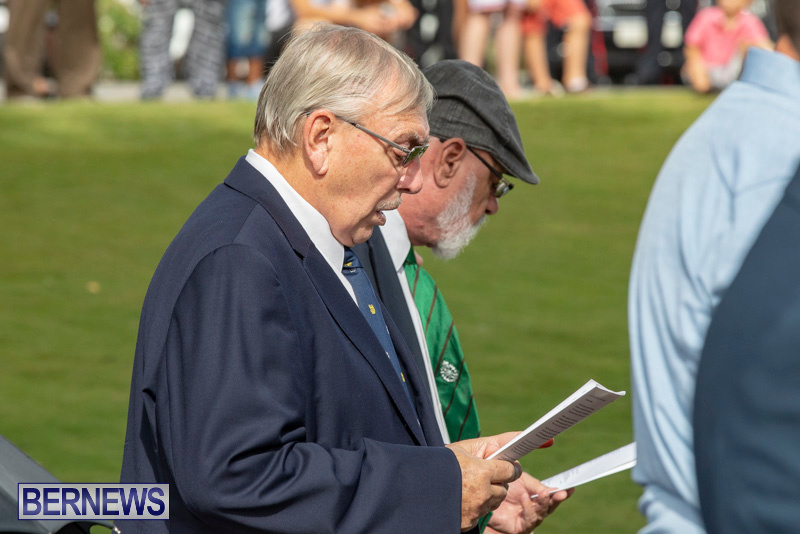 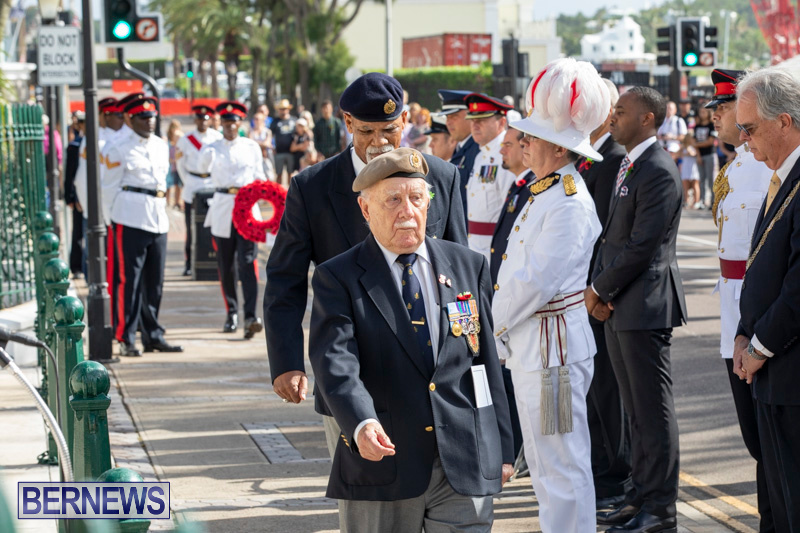 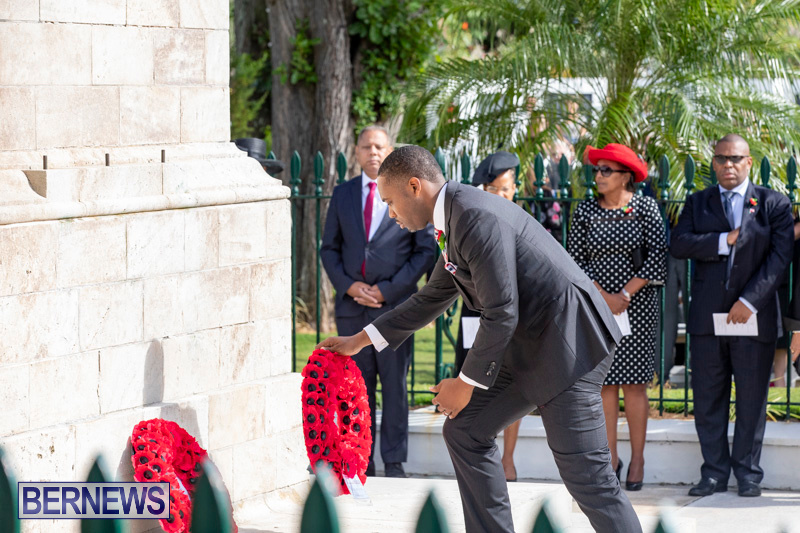 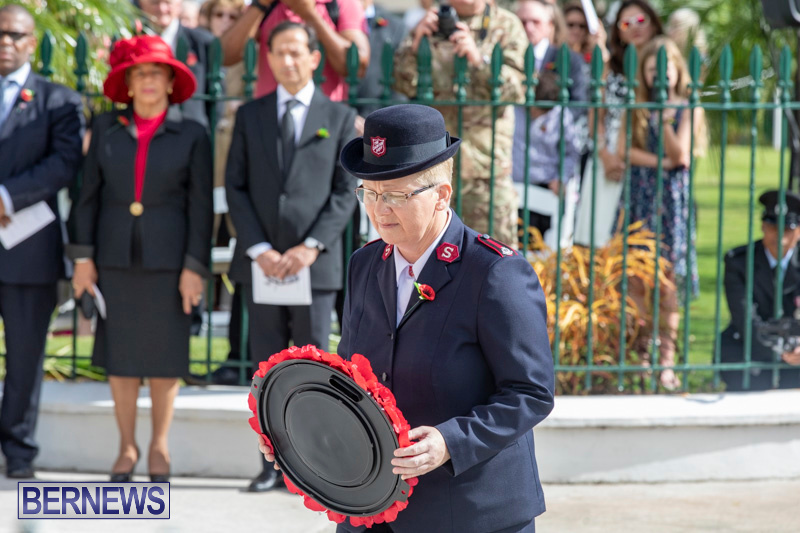 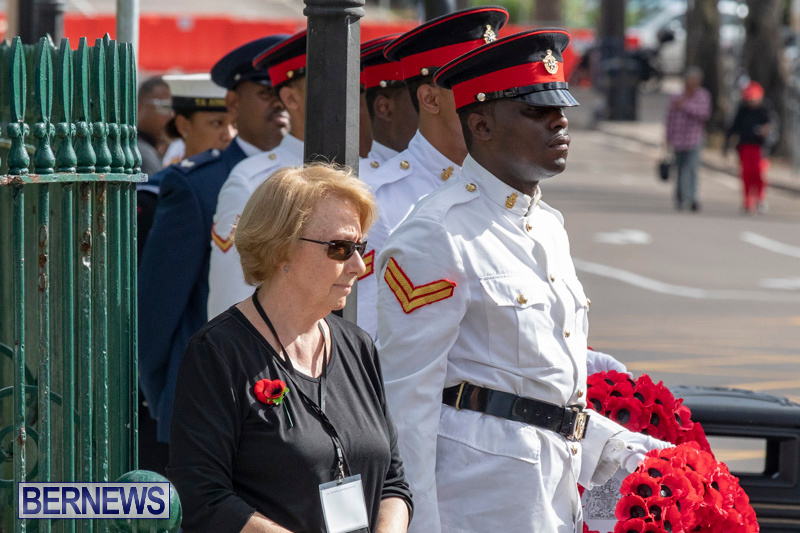 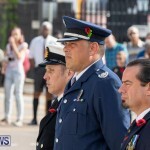 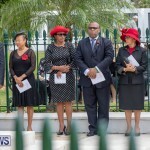 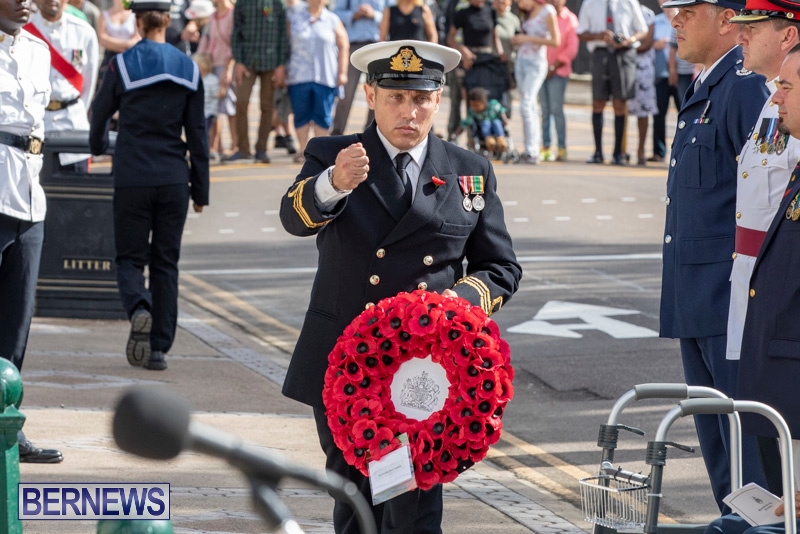 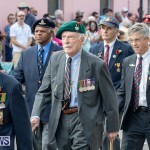 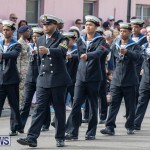 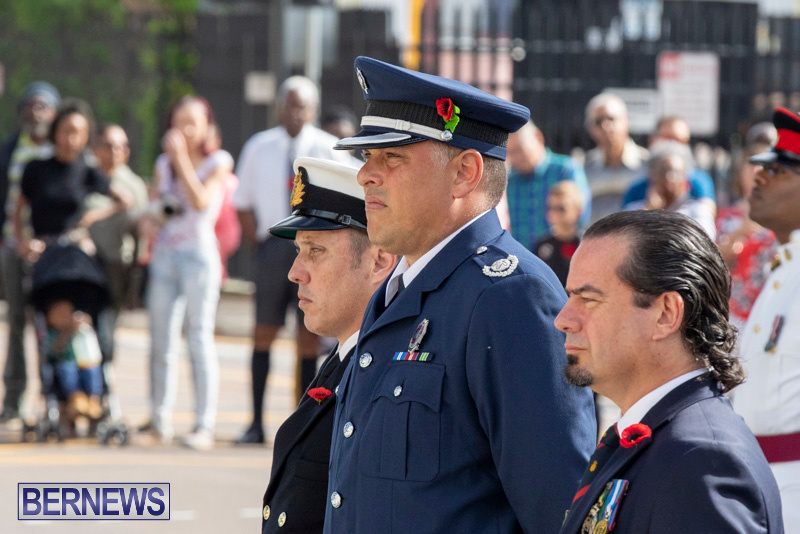 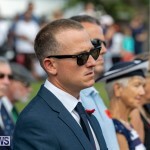 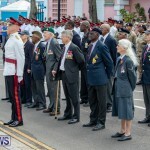 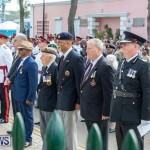 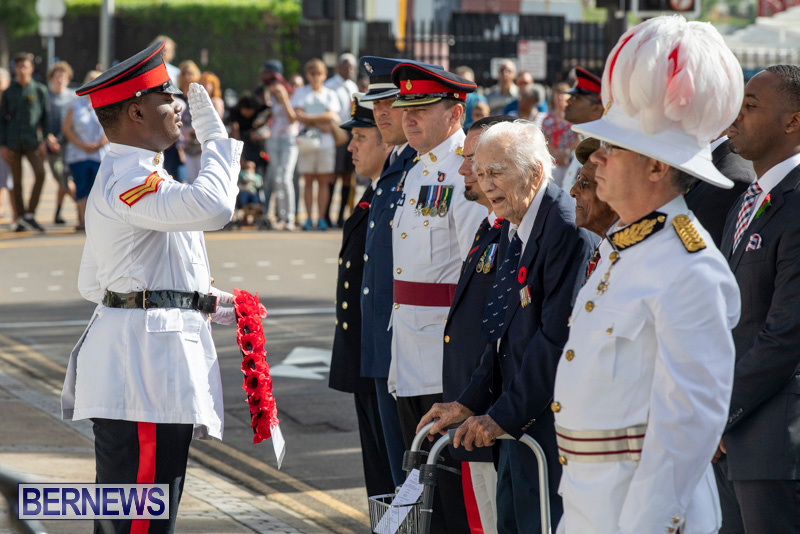 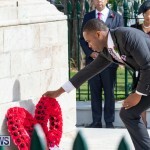 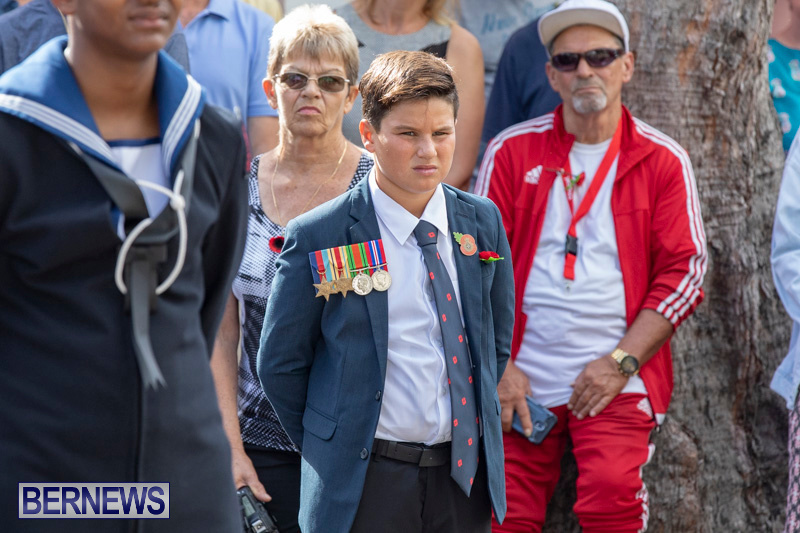 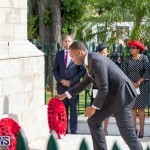 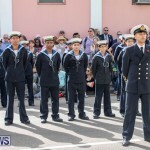 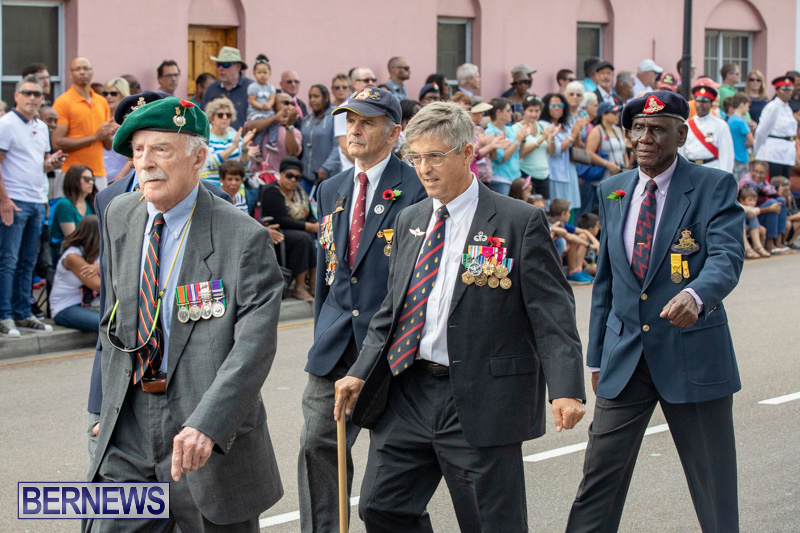 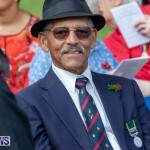 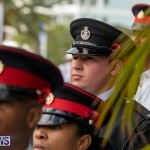 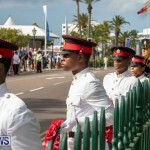 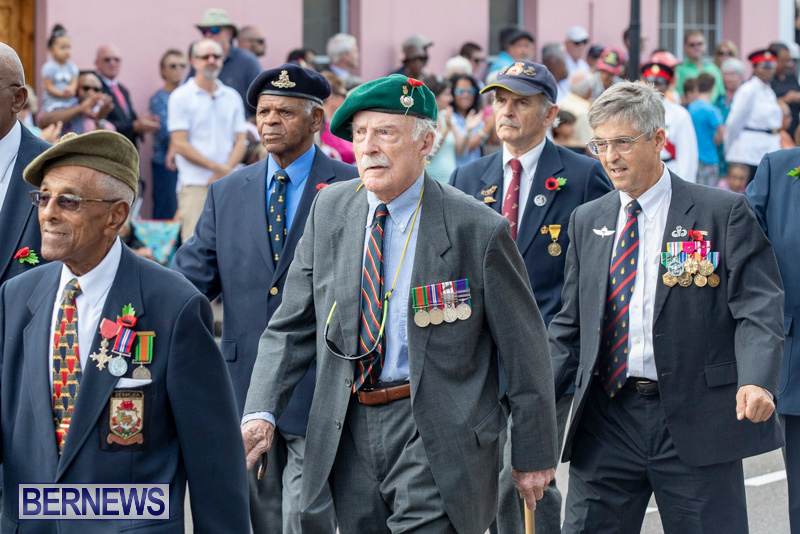 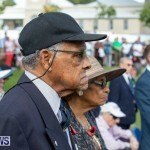 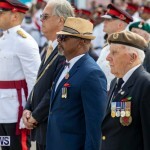 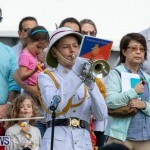 Crowds of people lined Front Street yesterday [Nov 11] for the Remembrance Day Parade, as they paid tribute to Bermuda’s war veterans who served in the two World Wars and other international conflicts, with the event also serving to mark the 100th anniversary of the end of the First World War. 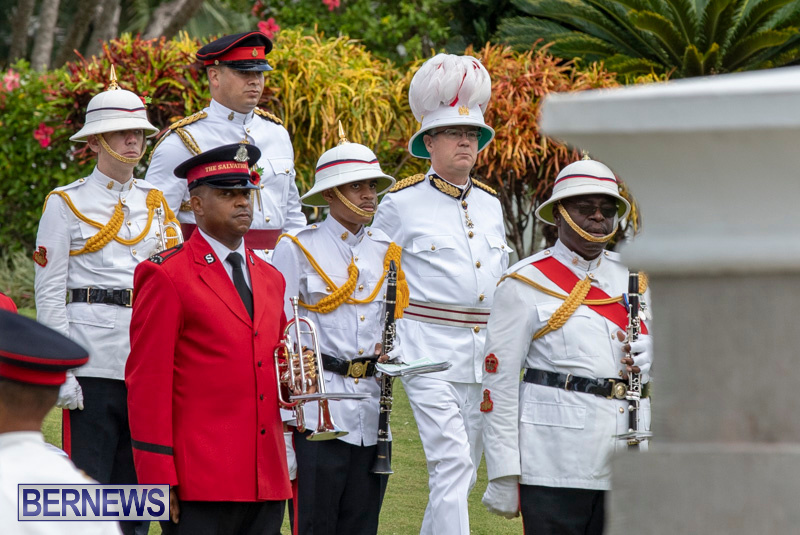 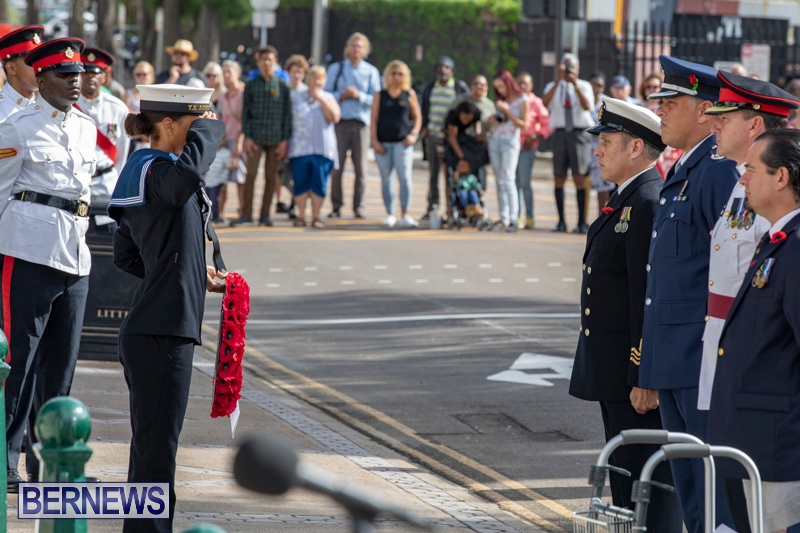 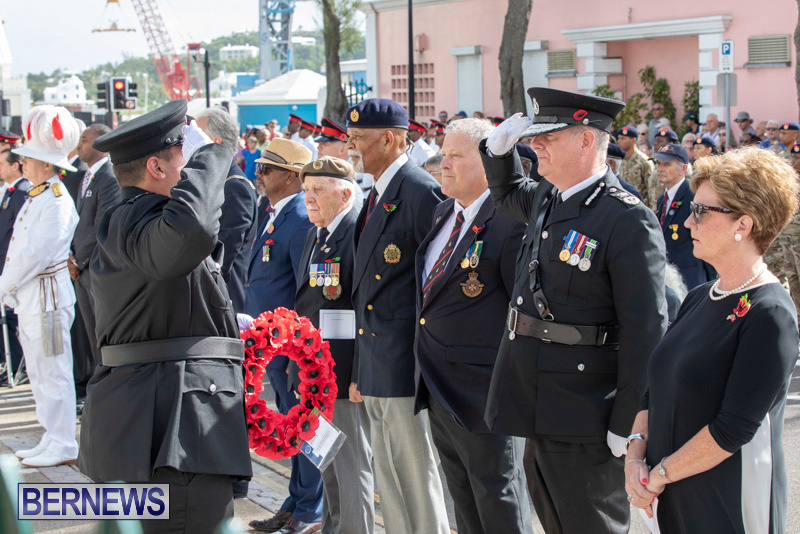 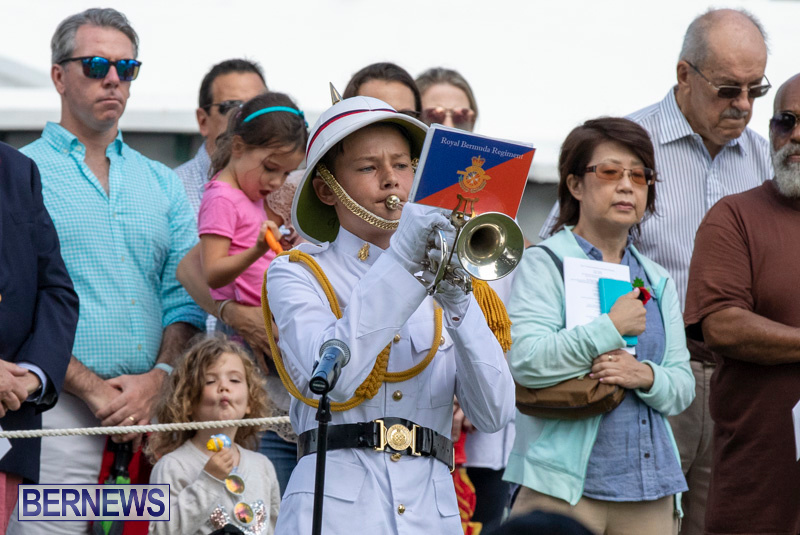 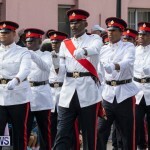 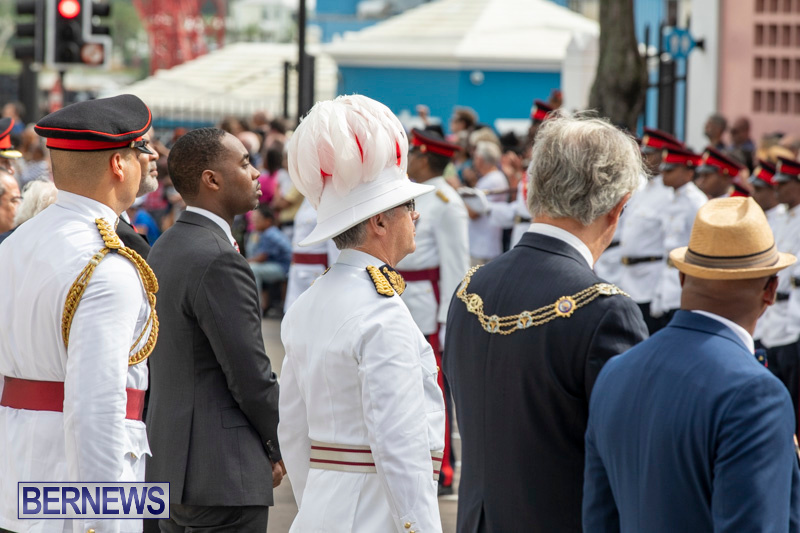 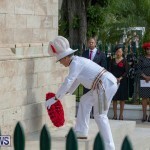 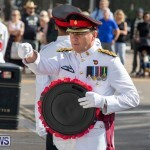 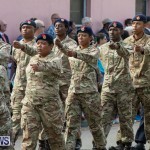 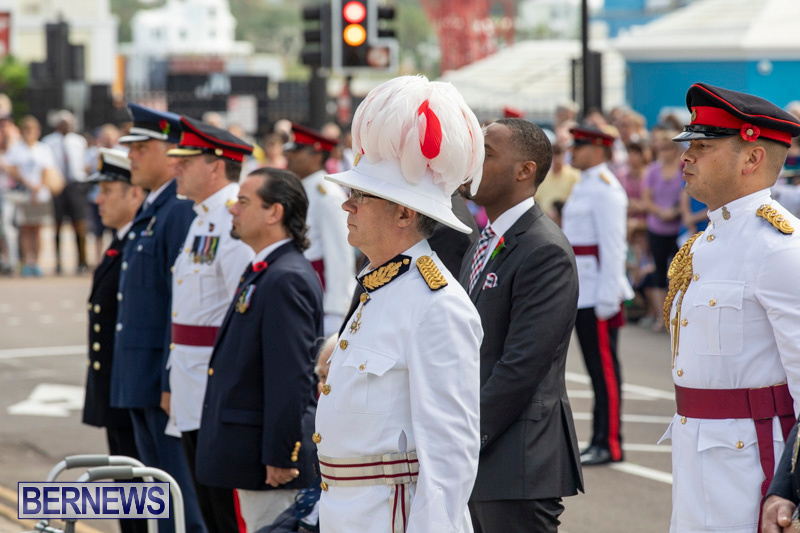 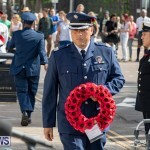 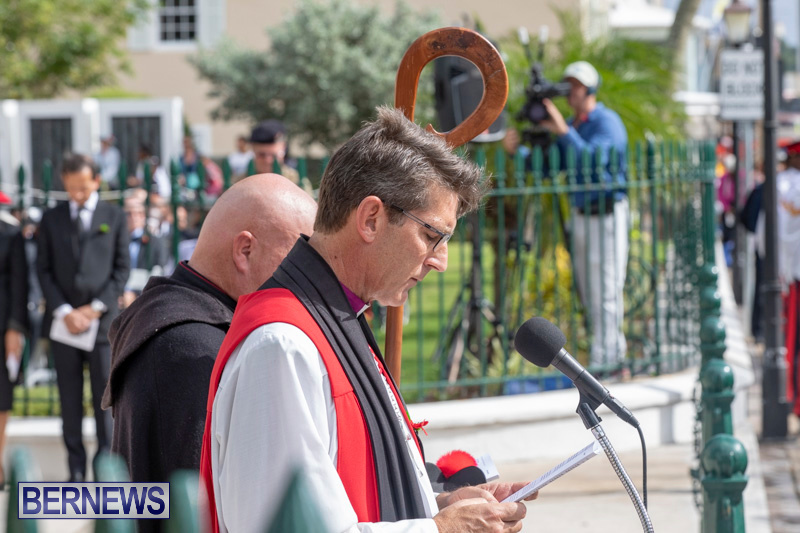 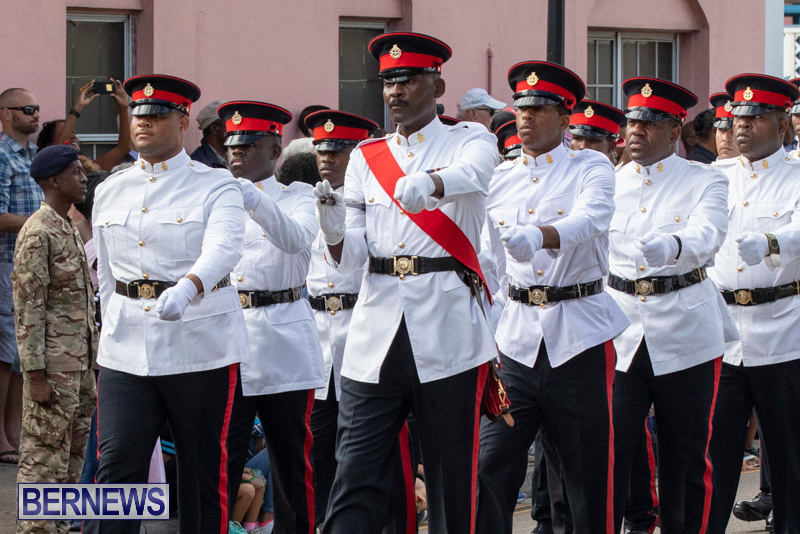 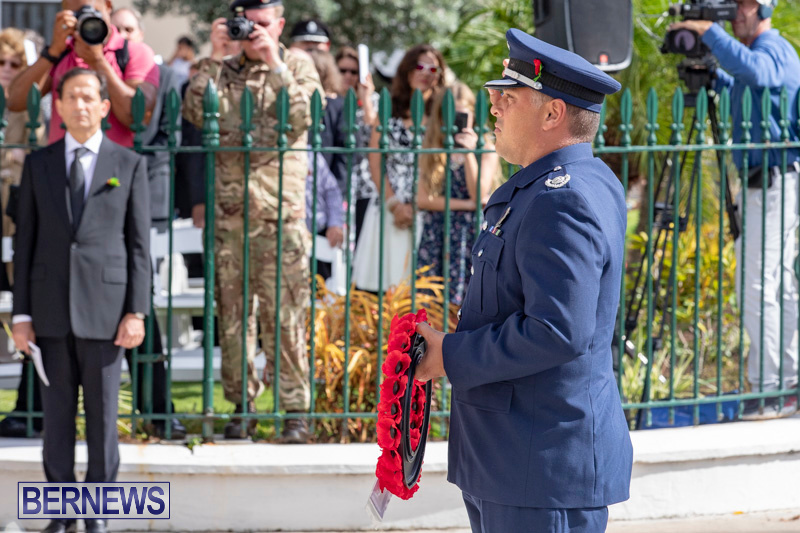 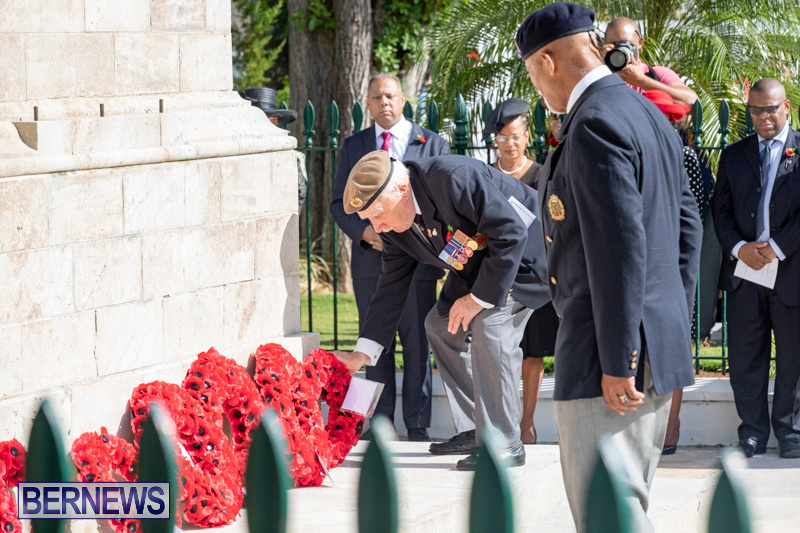 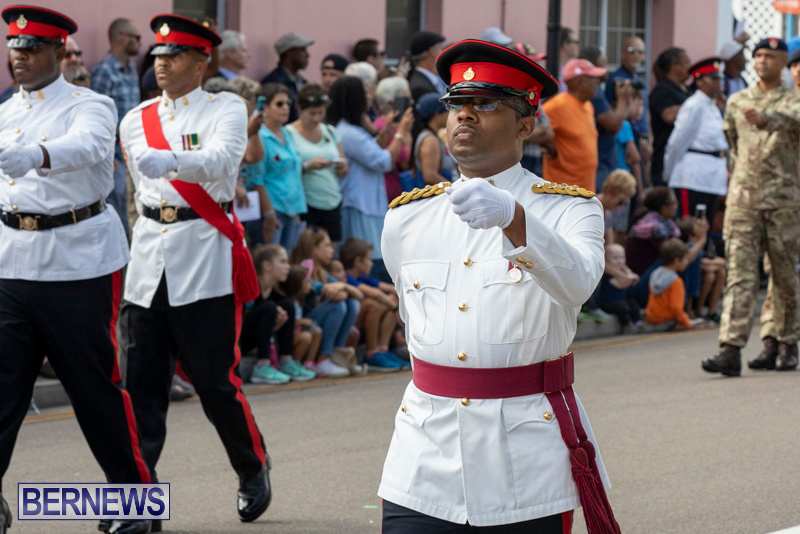 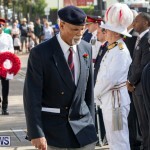 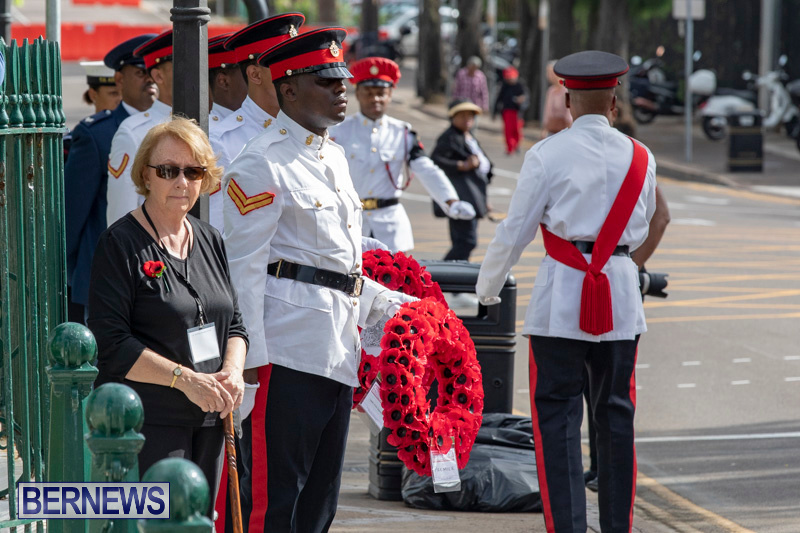 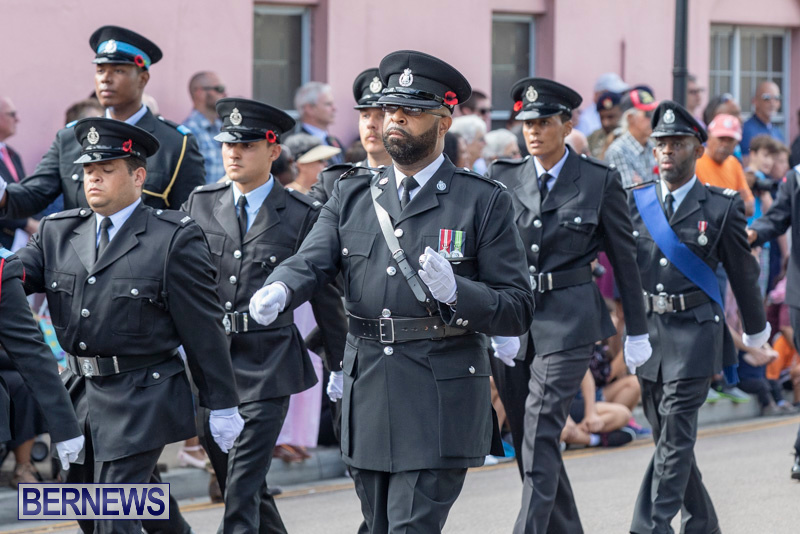 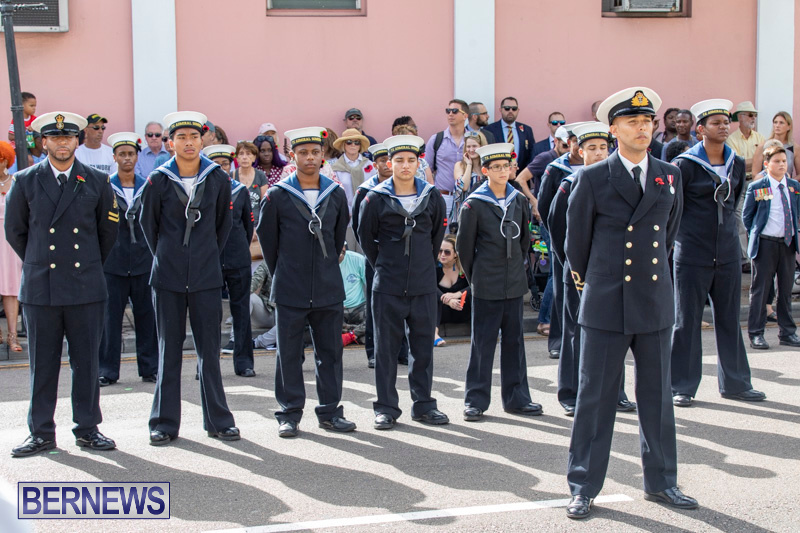 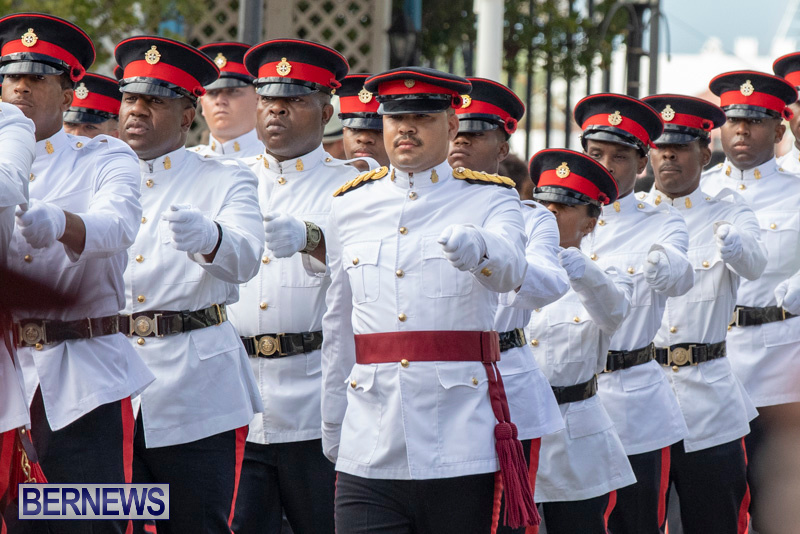 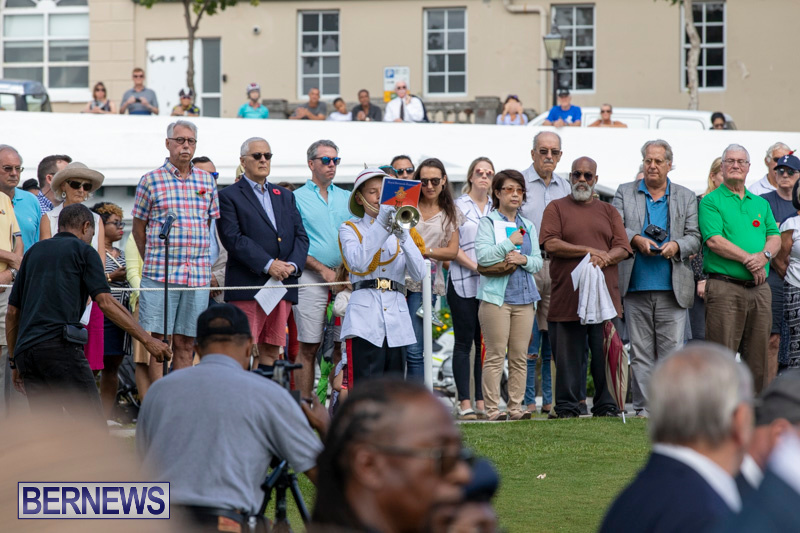 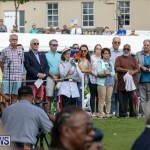 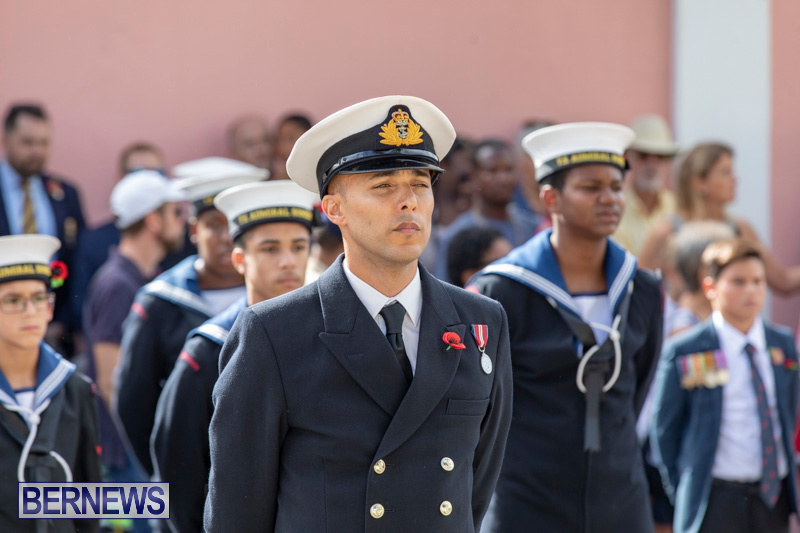 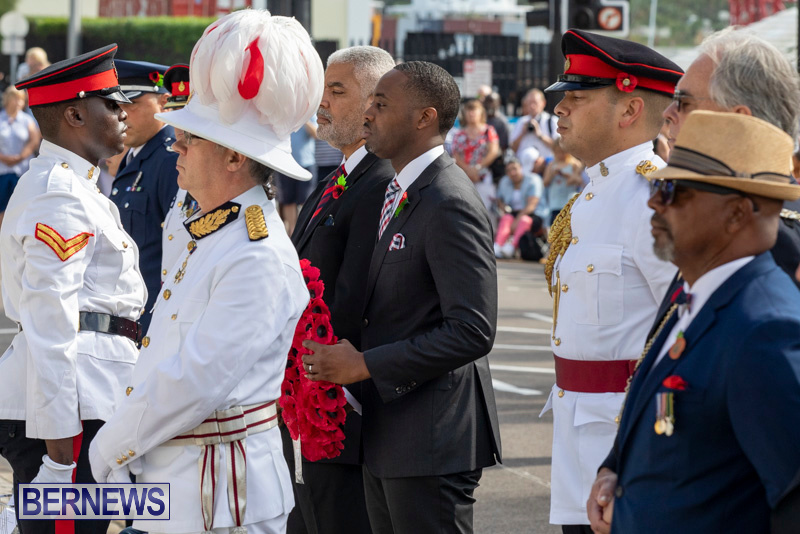 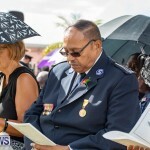 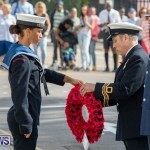 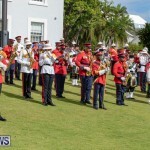 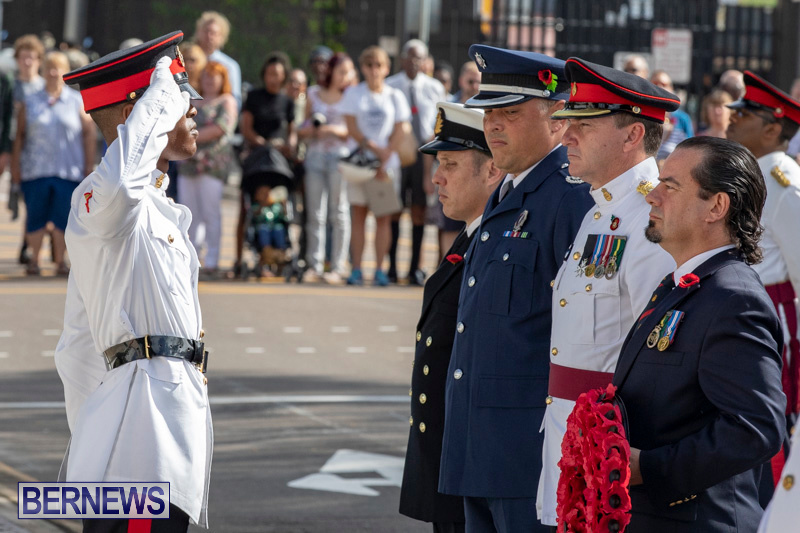 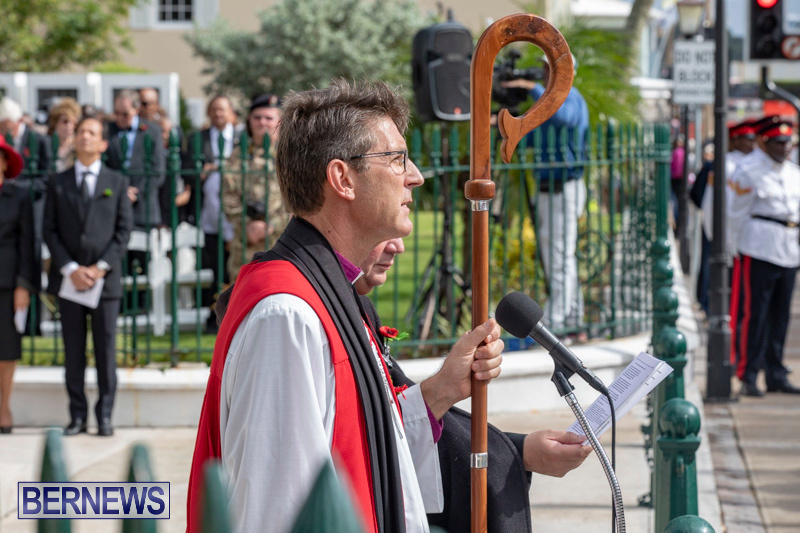 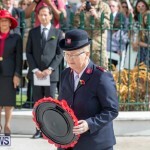 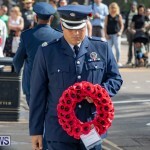 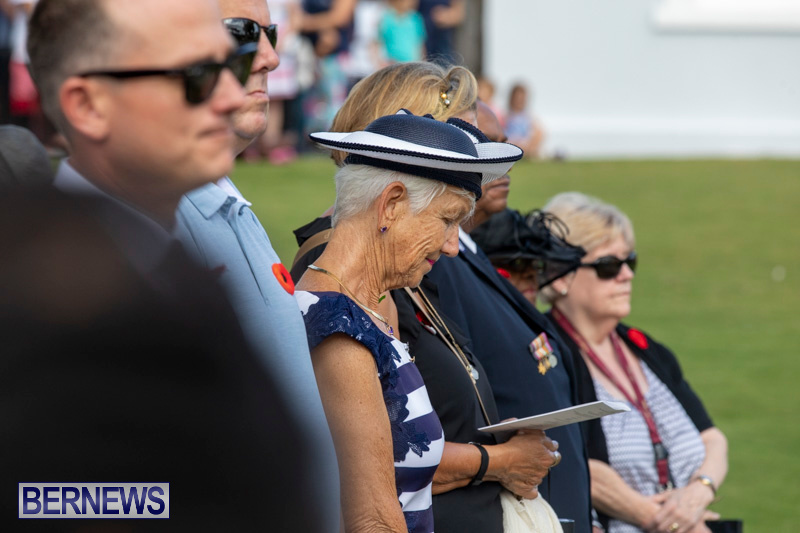 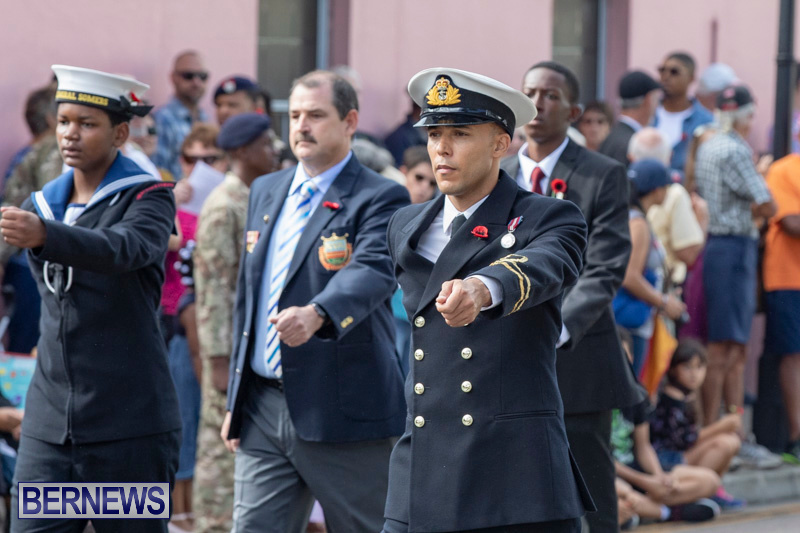 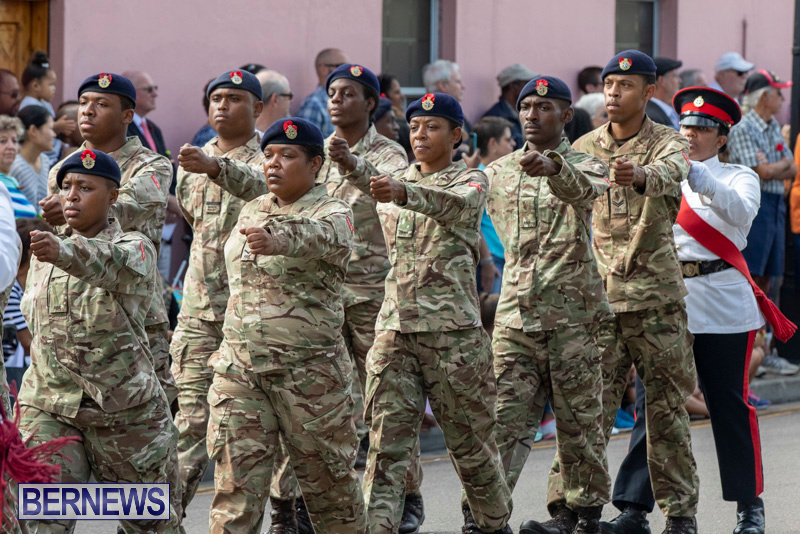 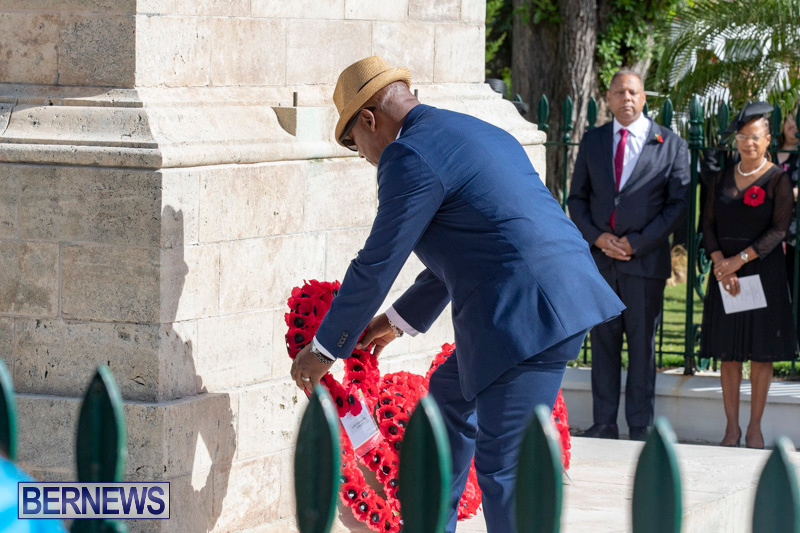 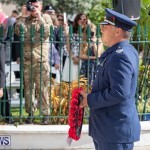 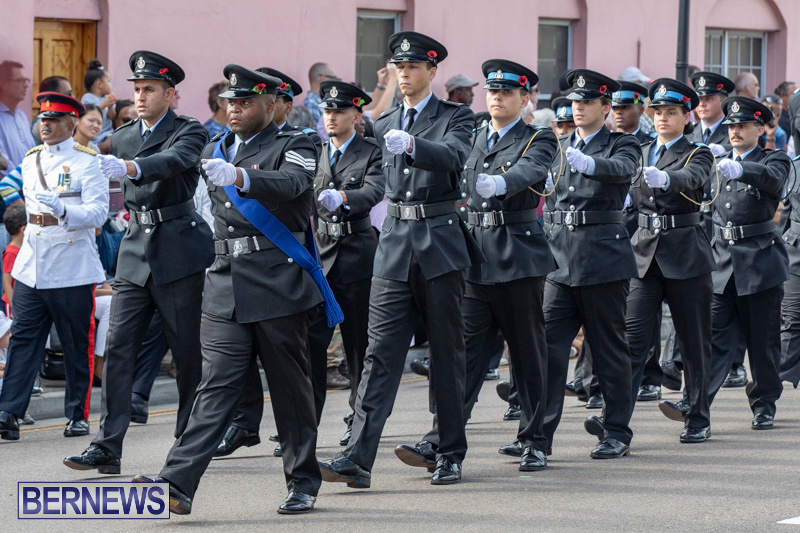 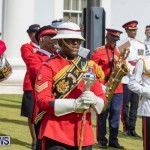 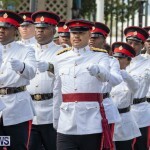 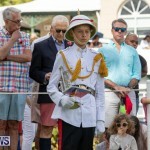 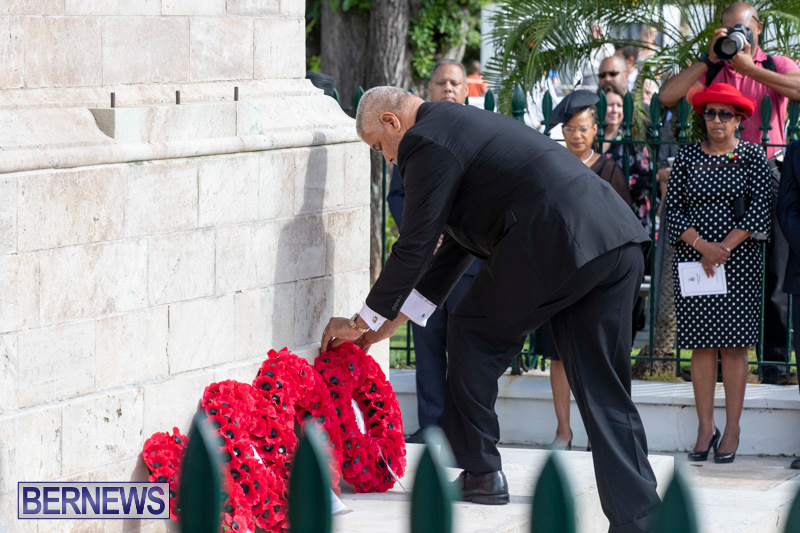 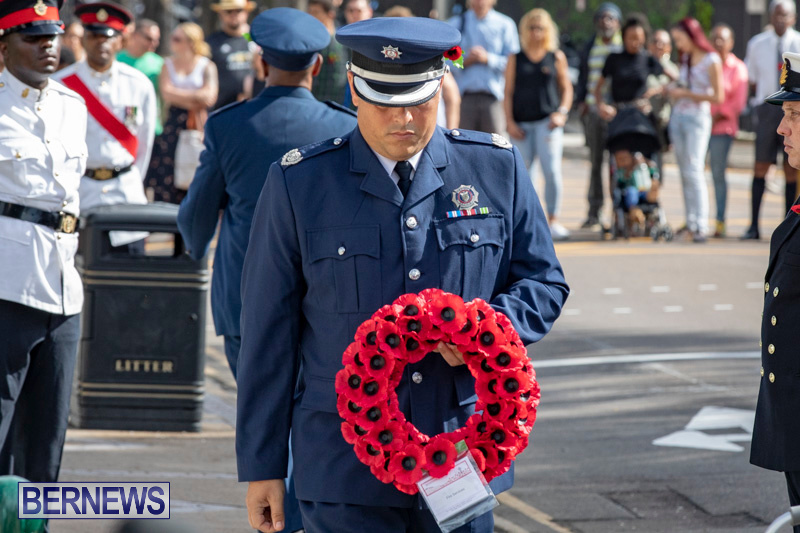 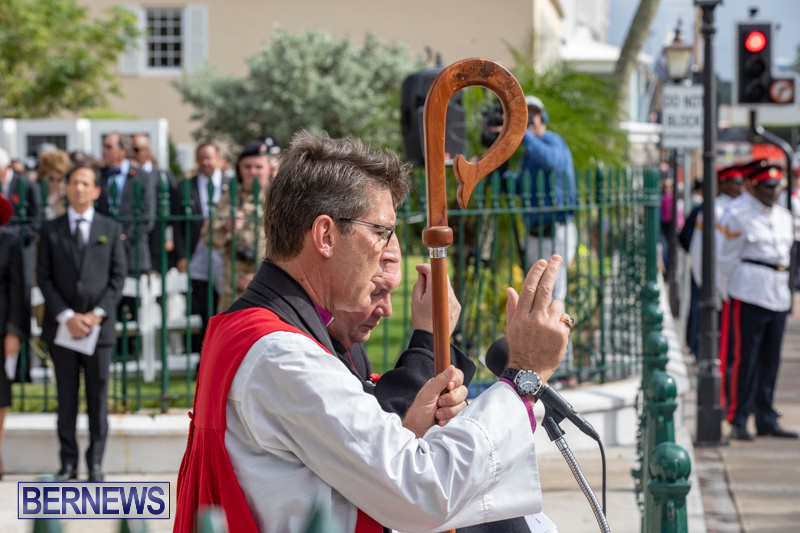 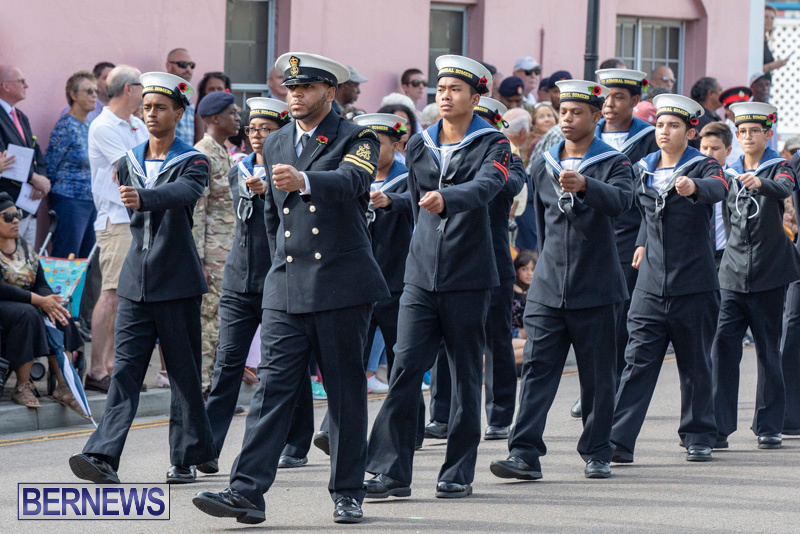 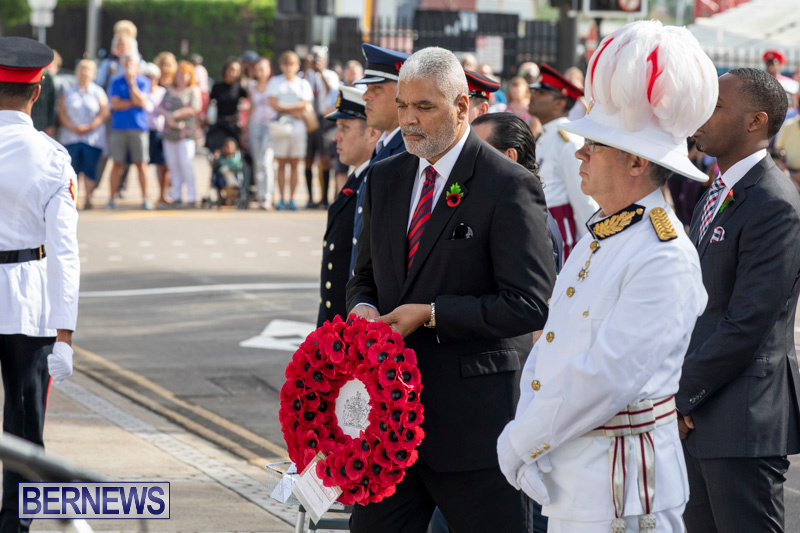 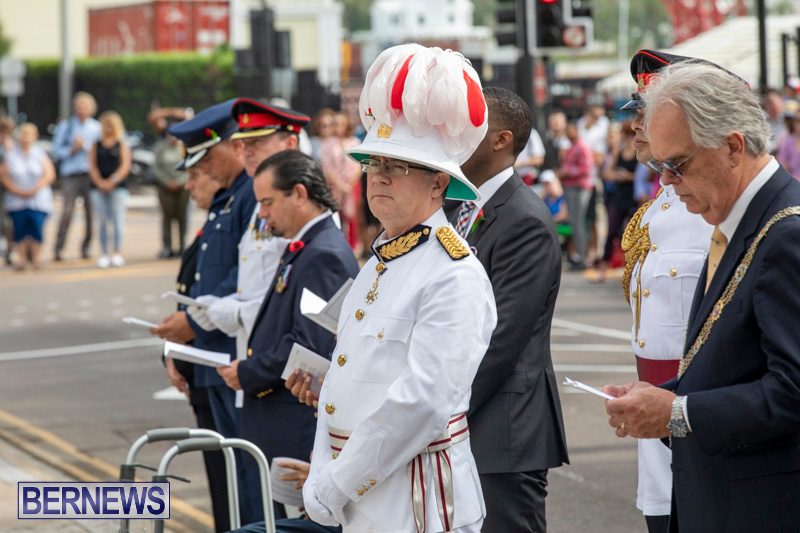 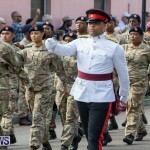 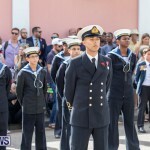 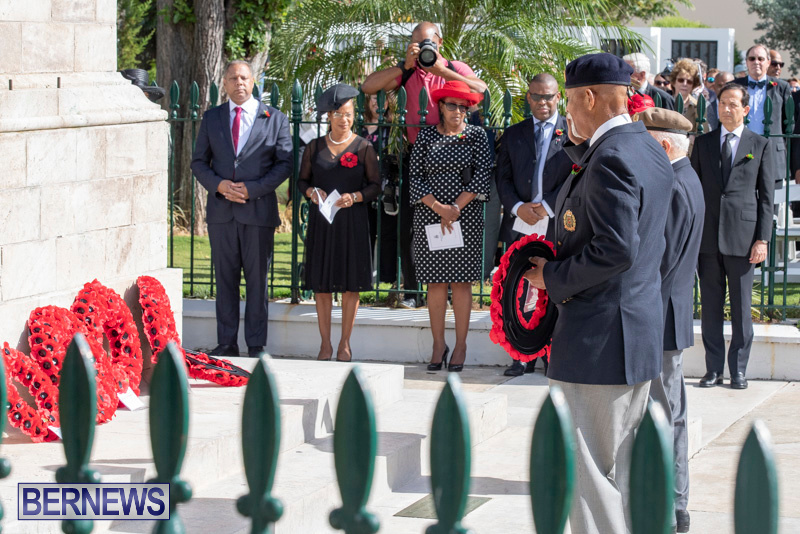 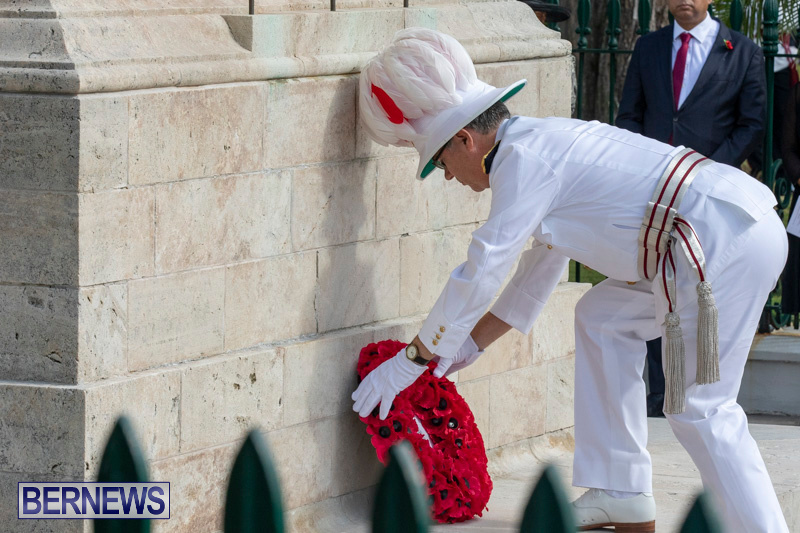 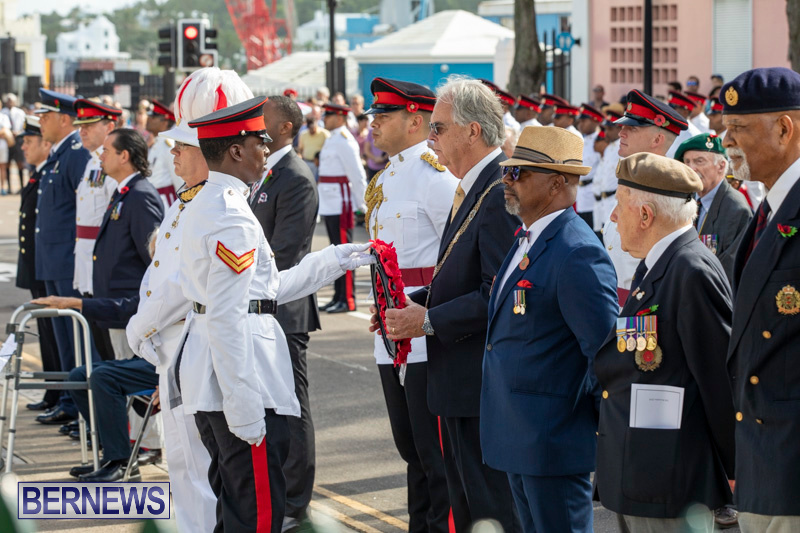 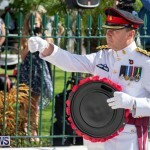 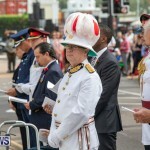 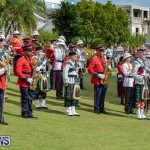 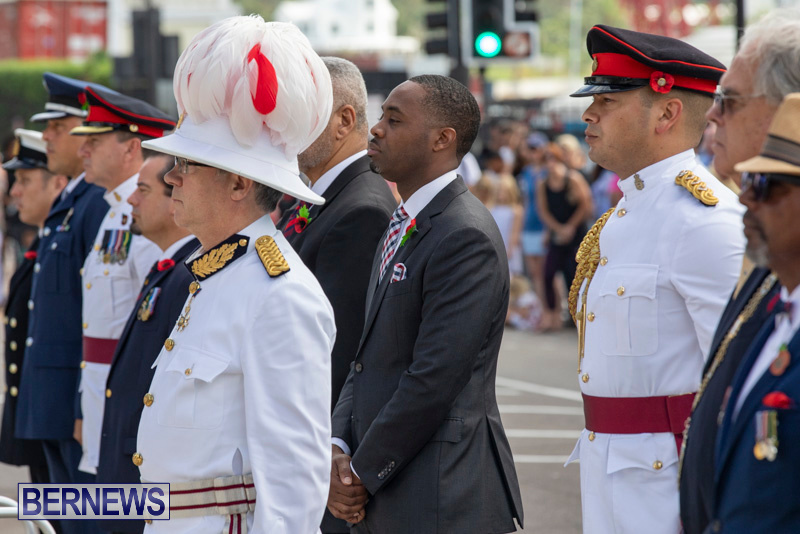 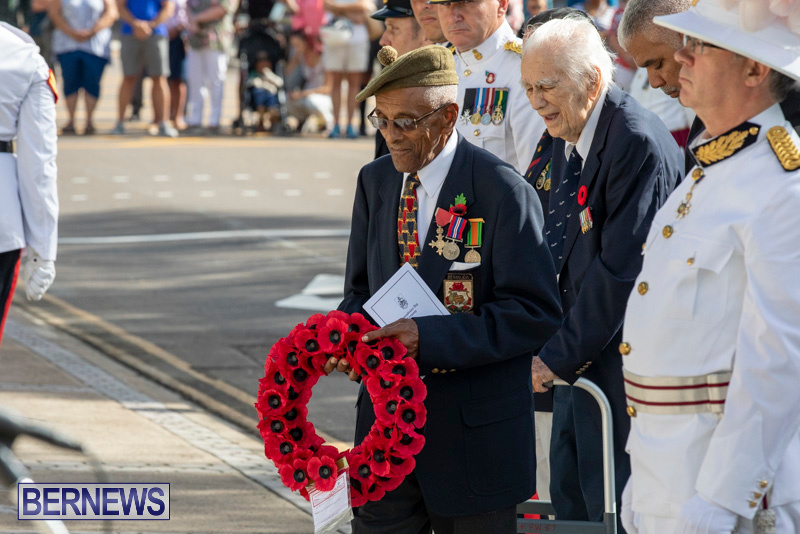 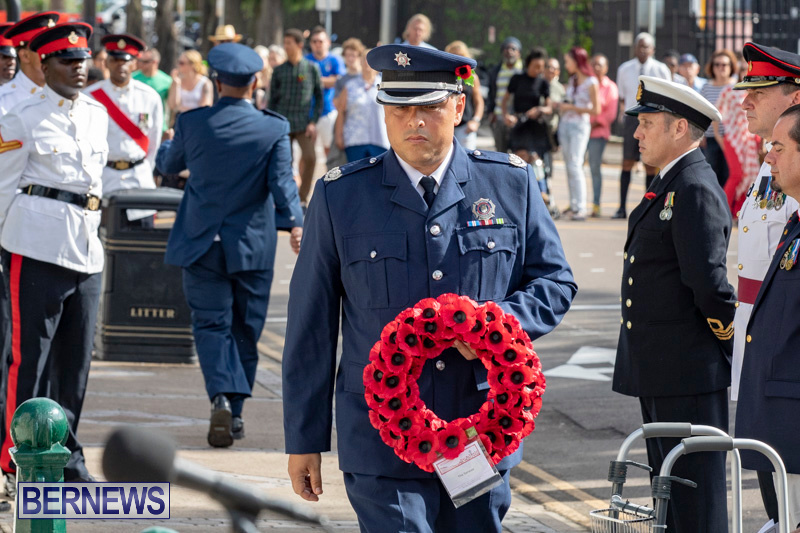 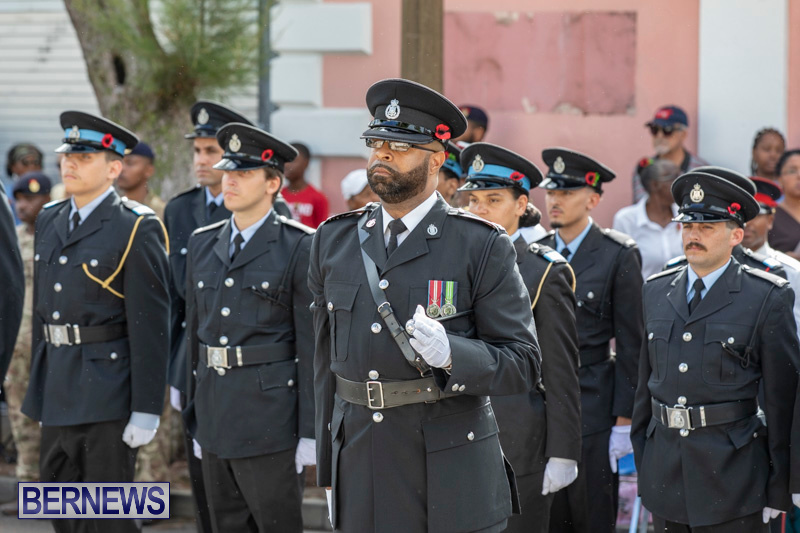 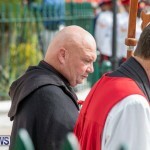 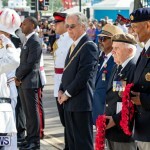 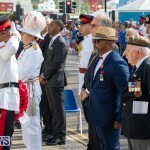 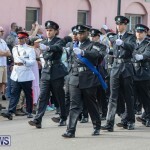 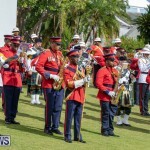 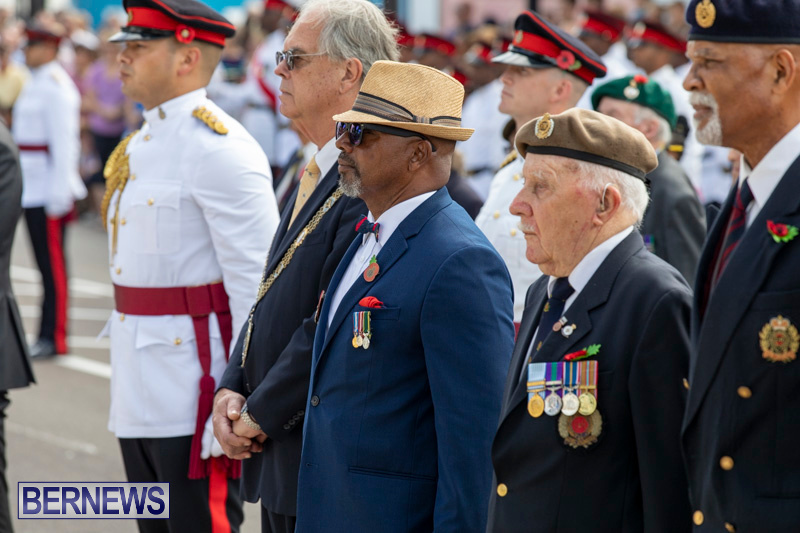 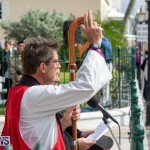 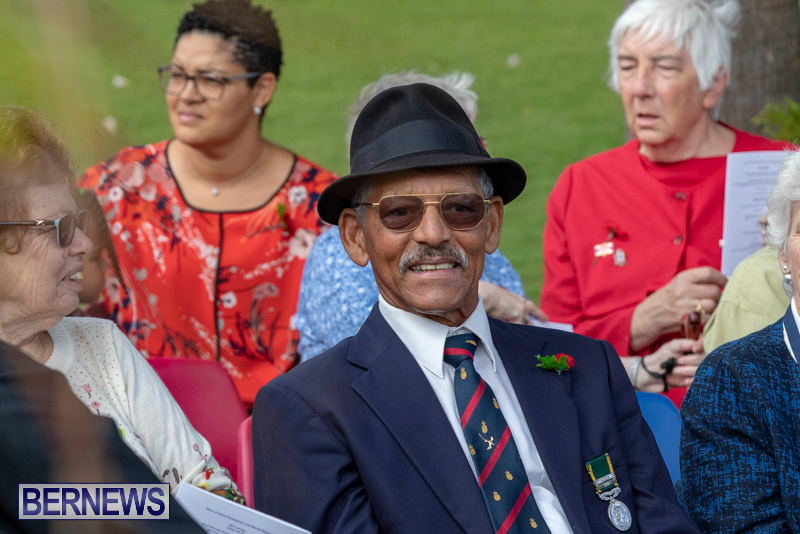 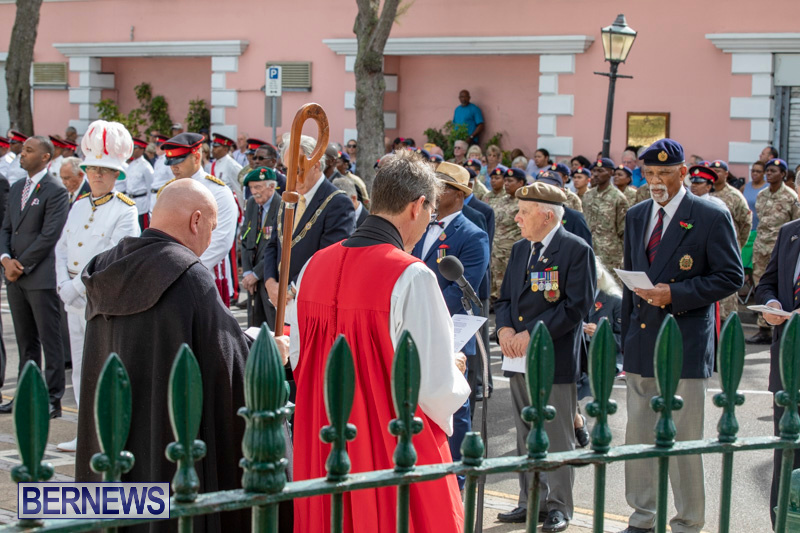 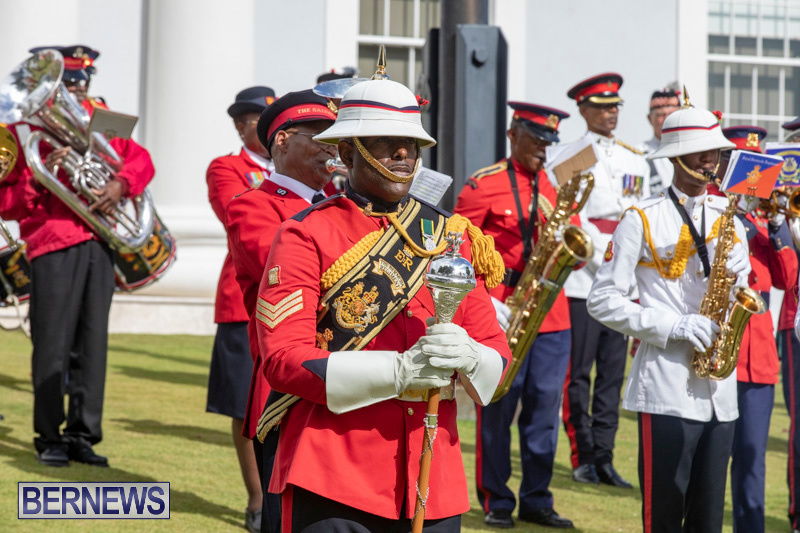 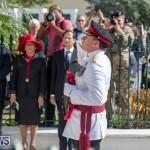 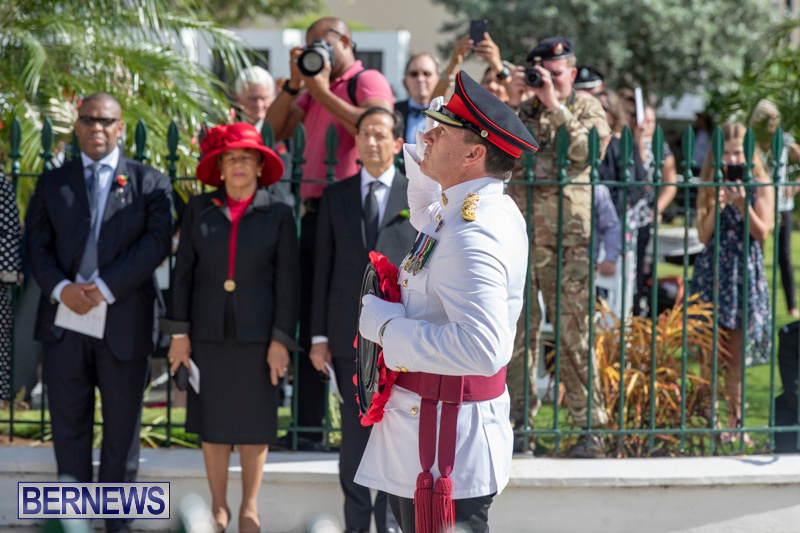 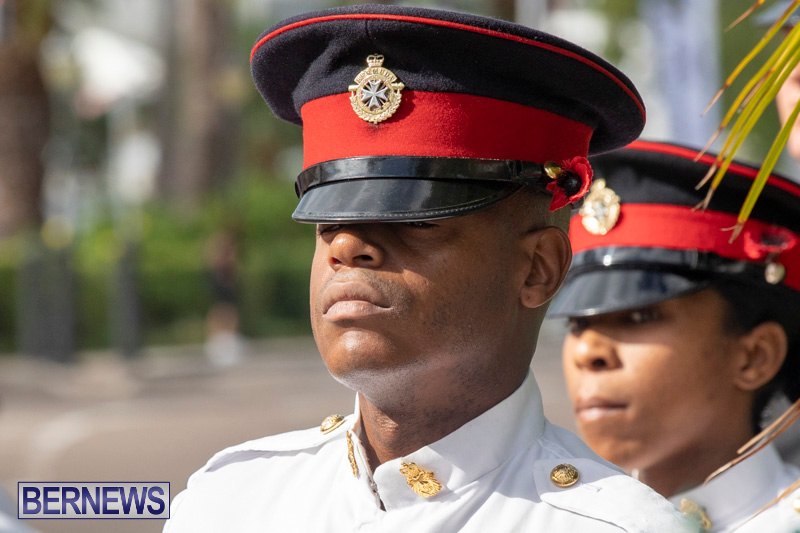 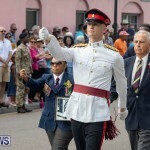 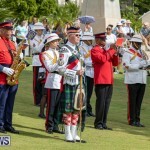 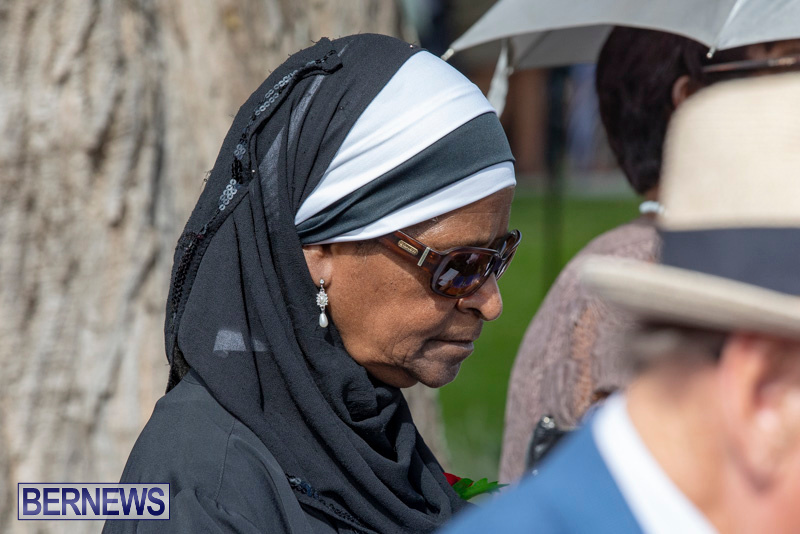 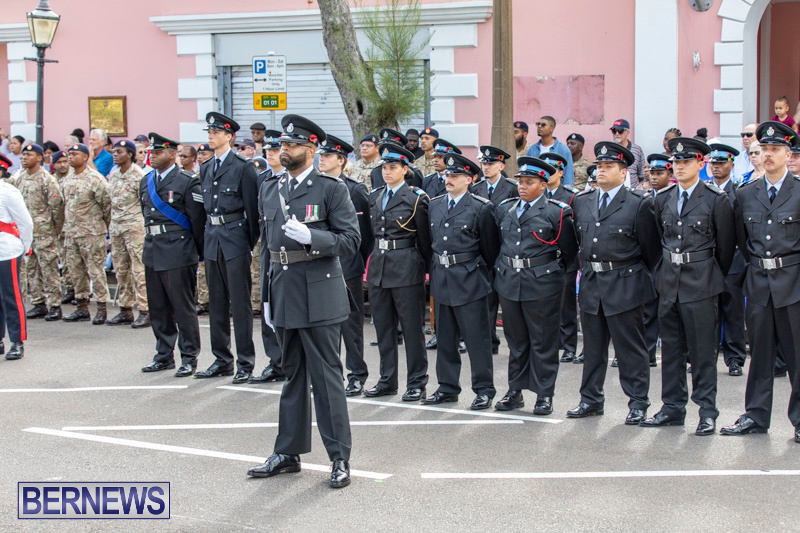 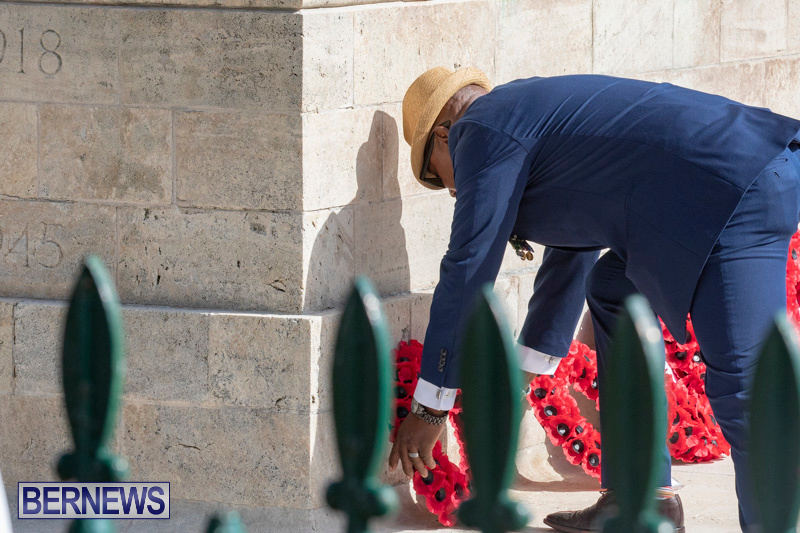 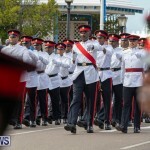 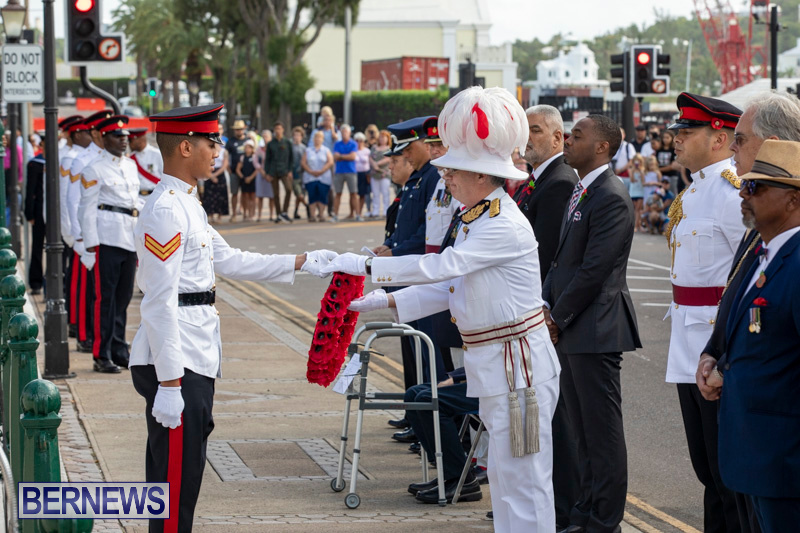 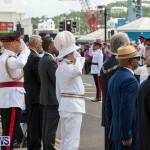 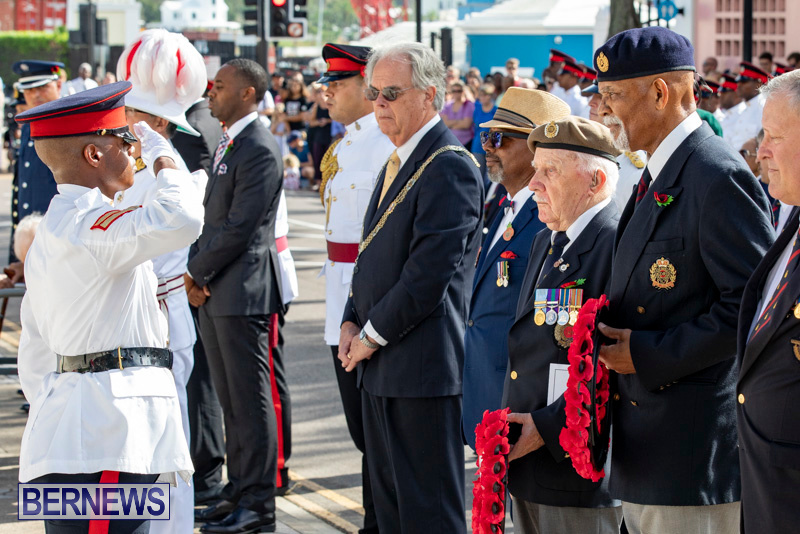 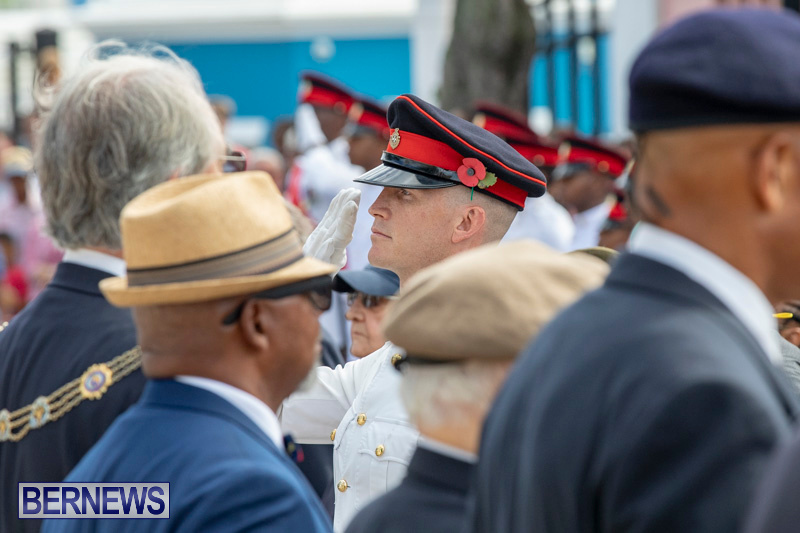 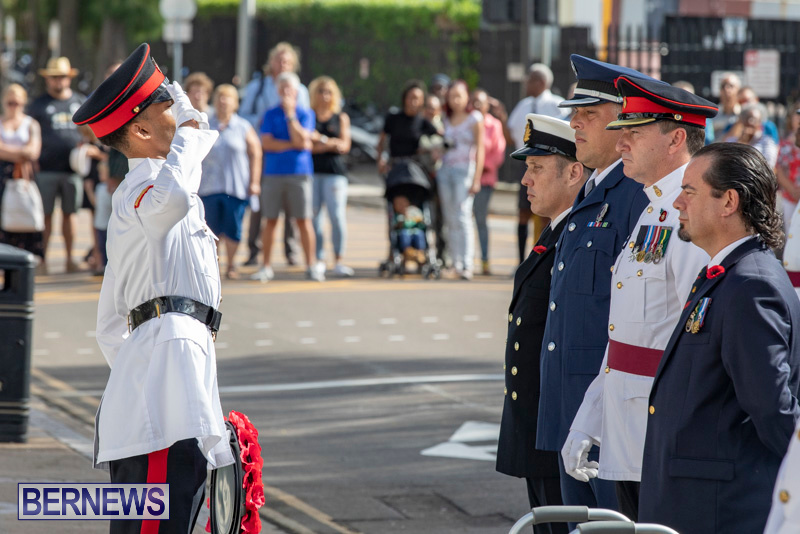 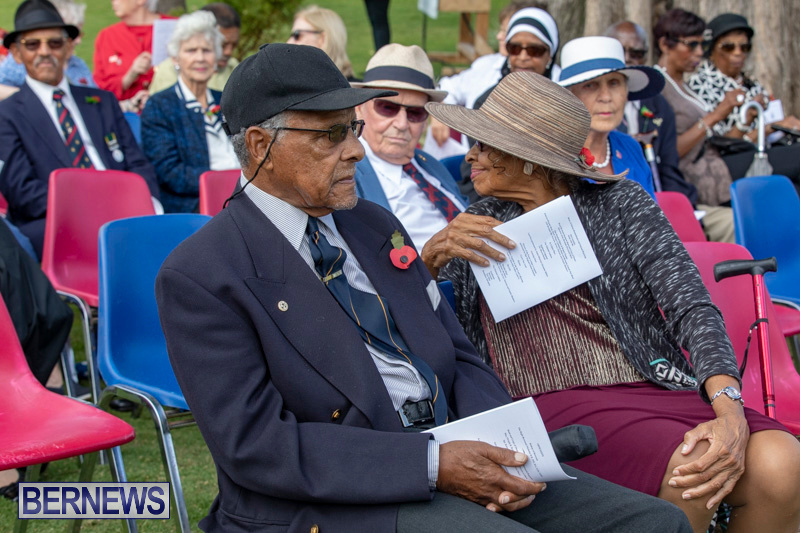 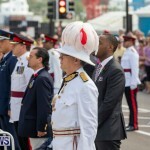 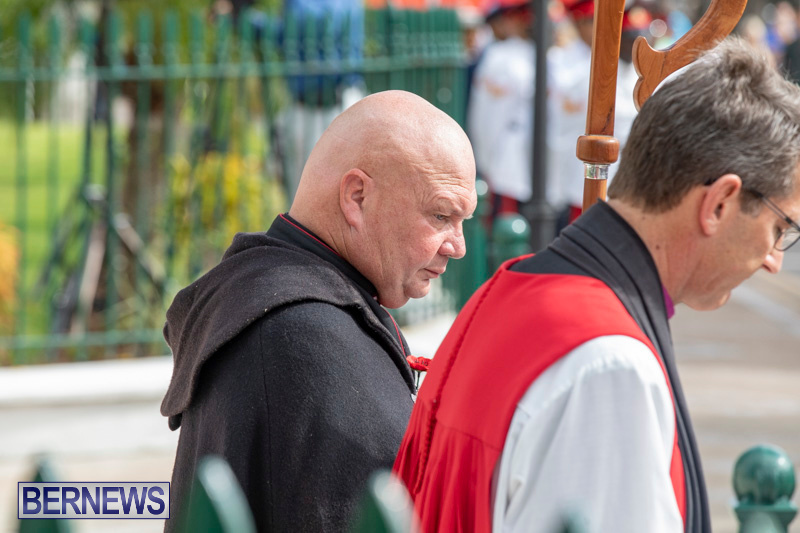 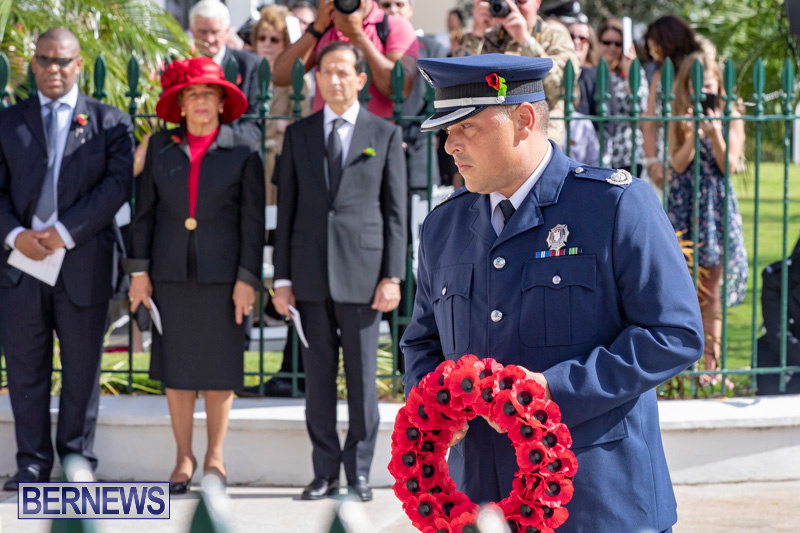 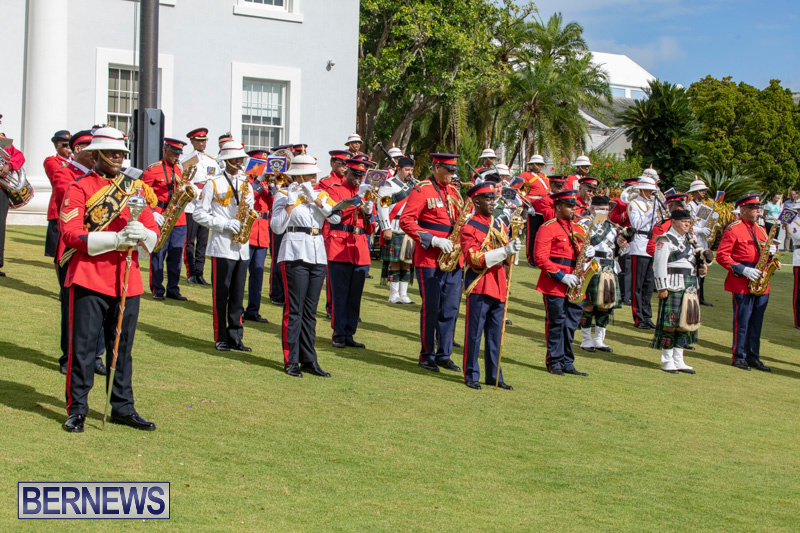 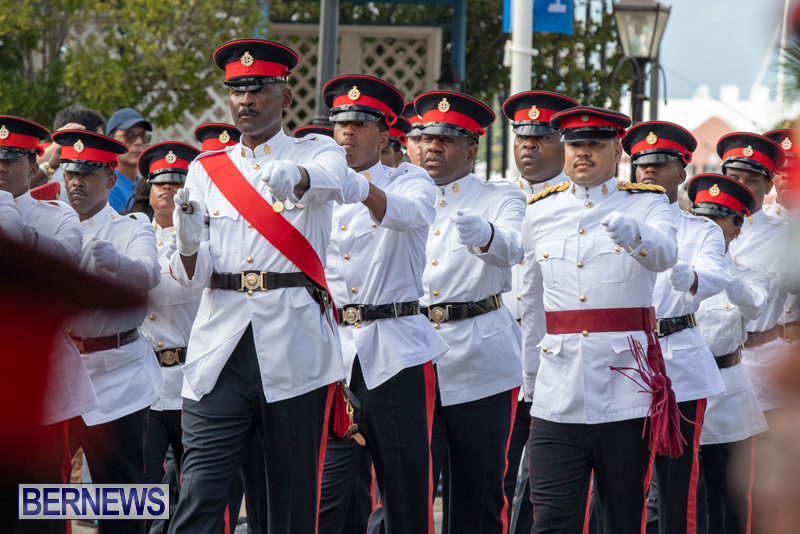 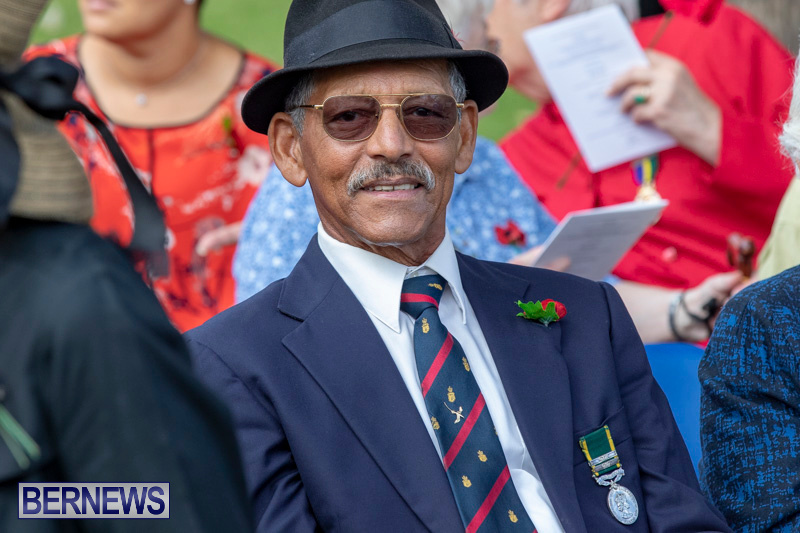 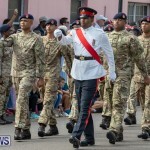 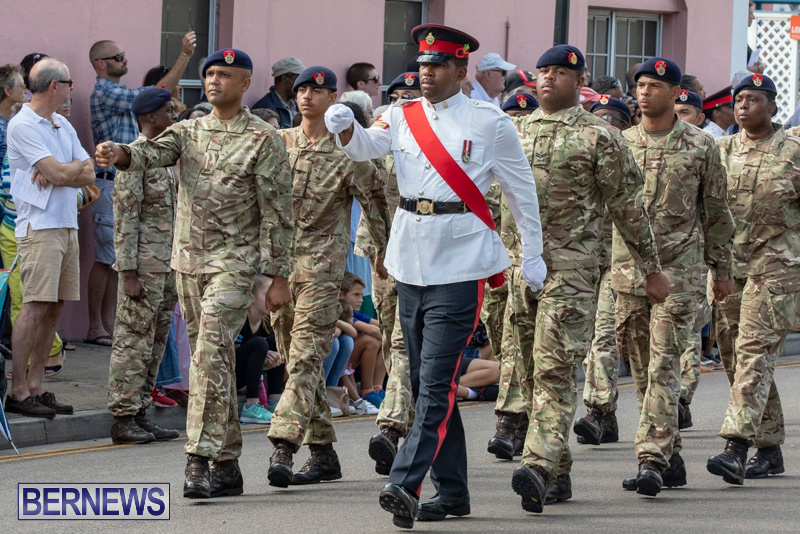 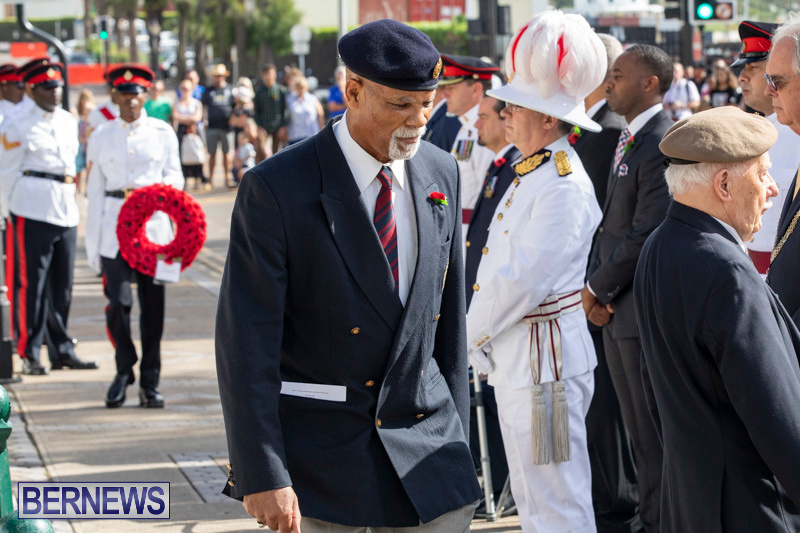 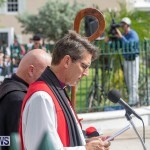 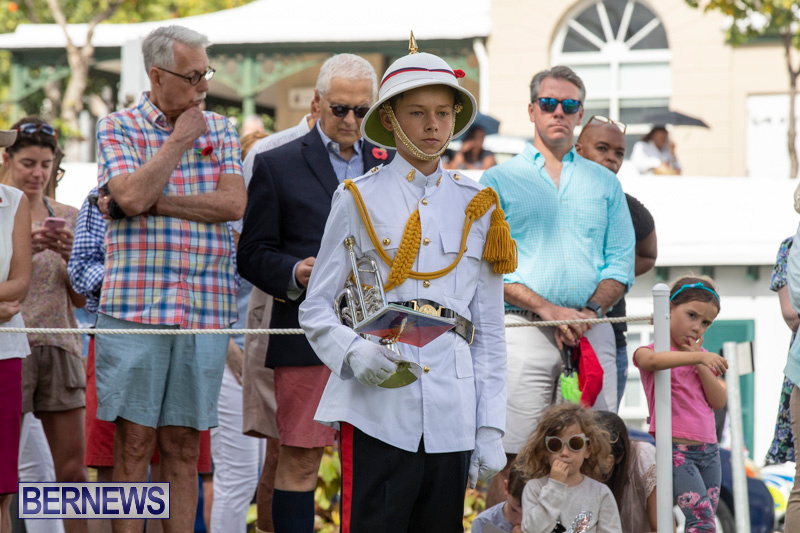 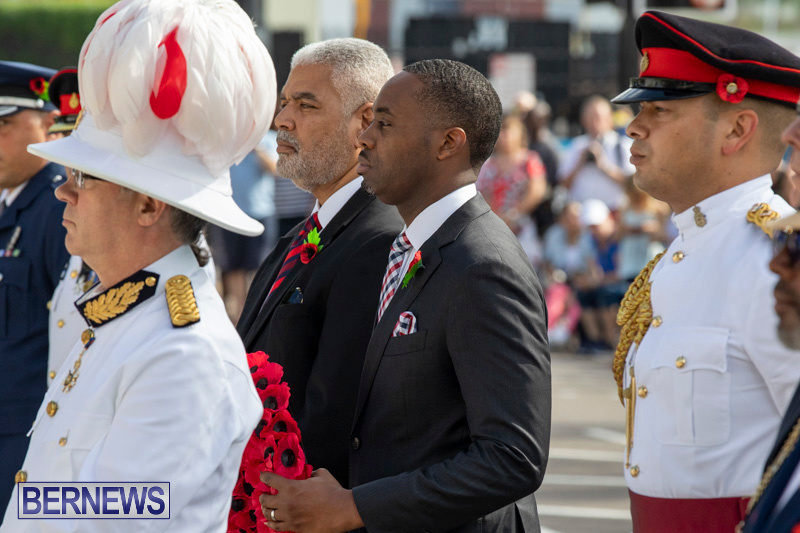 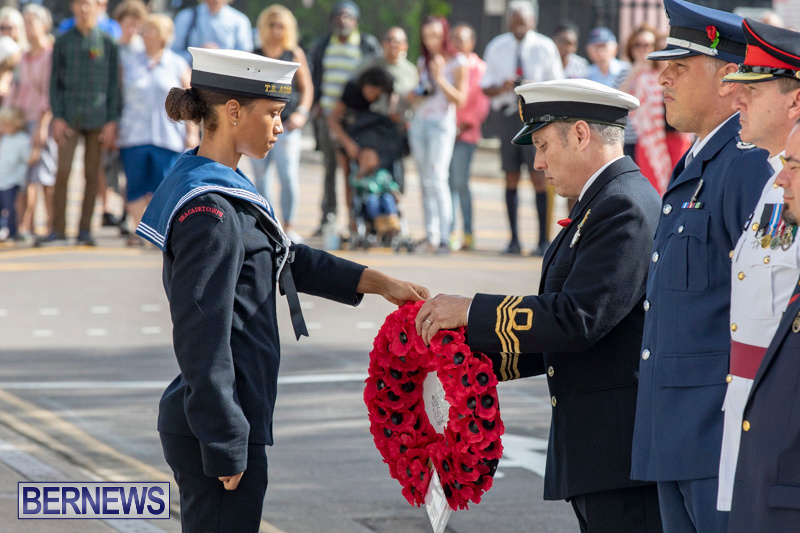 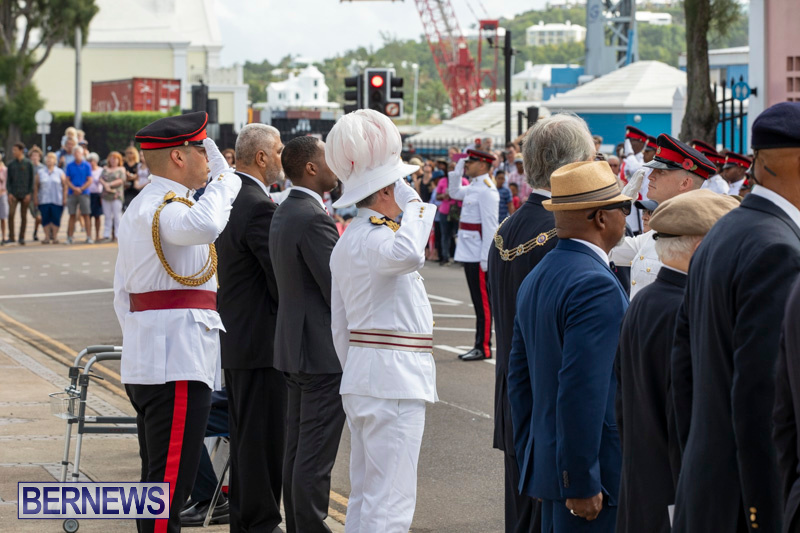 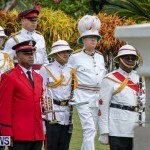 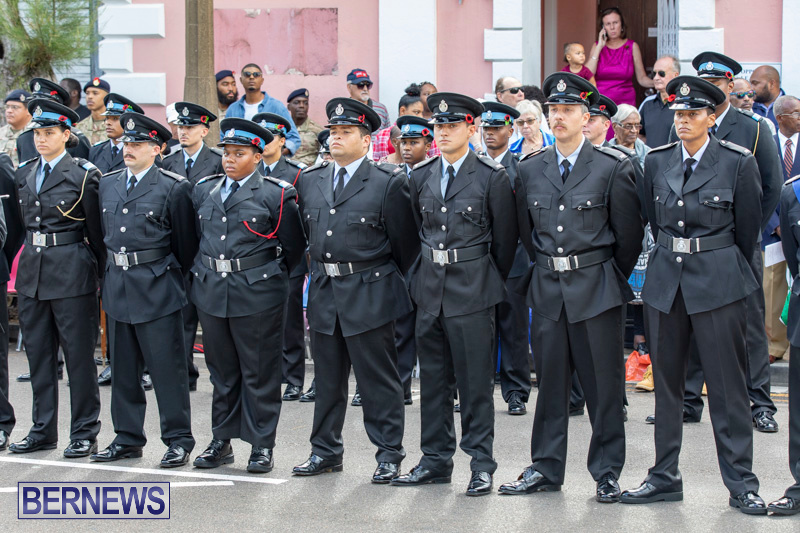 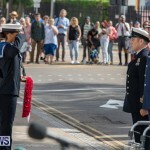 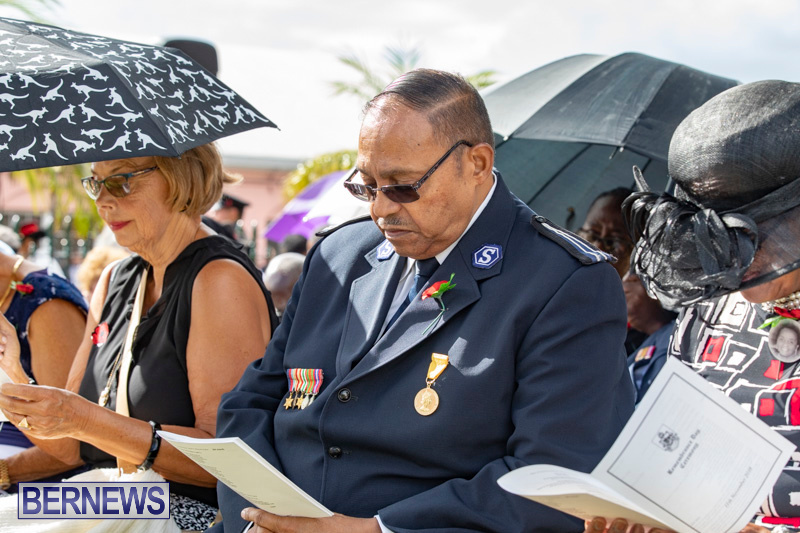 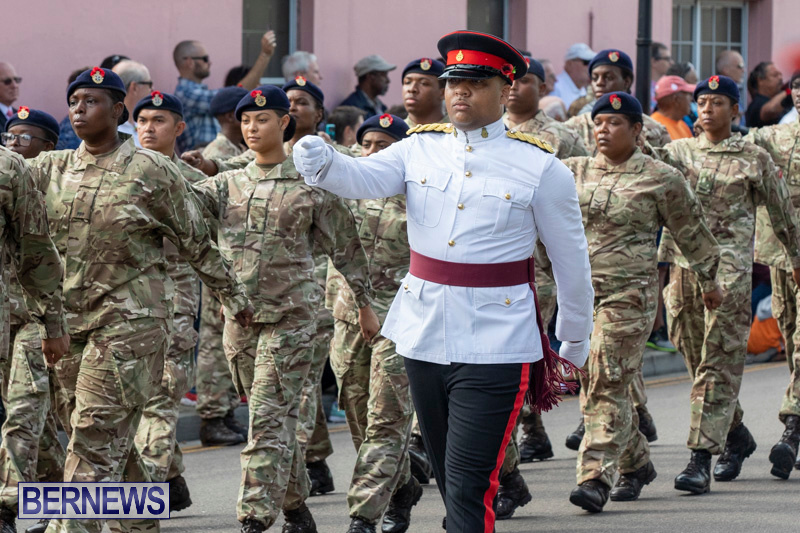 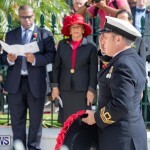 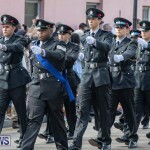 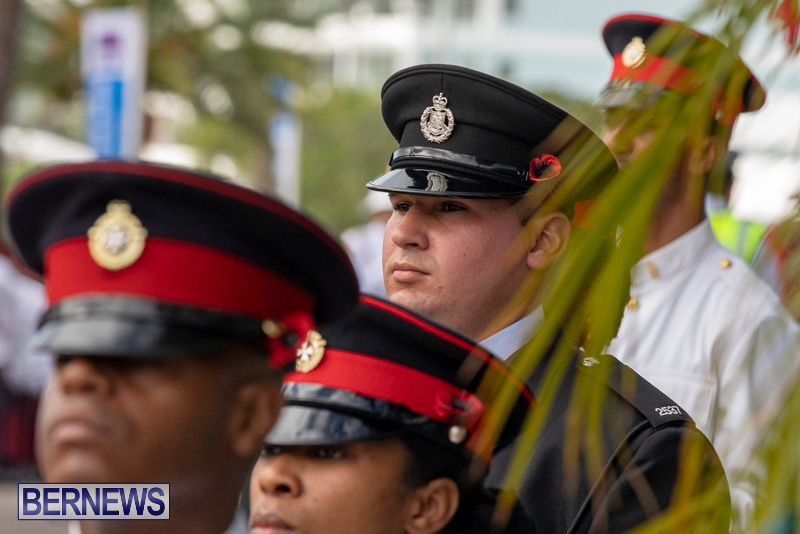 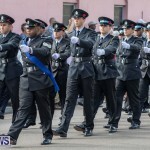 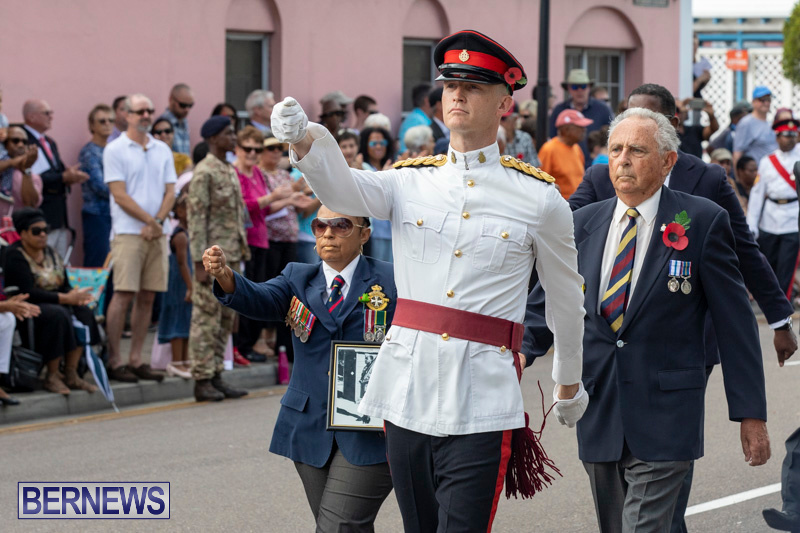 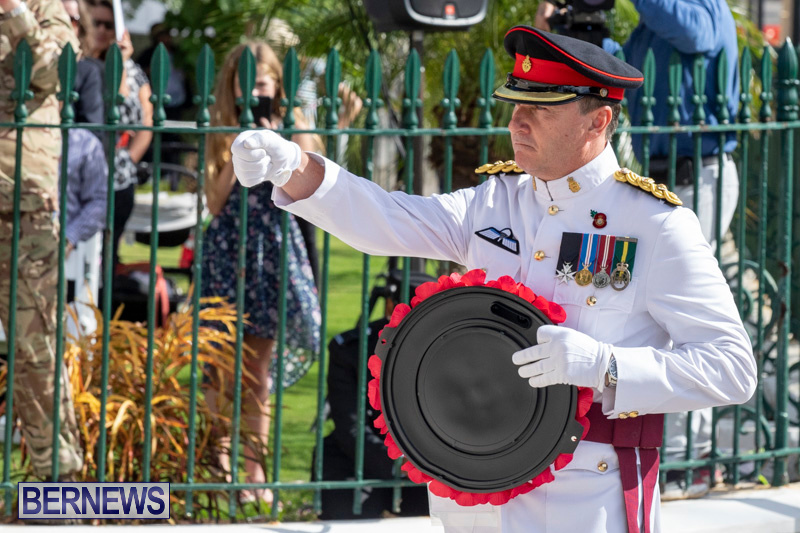 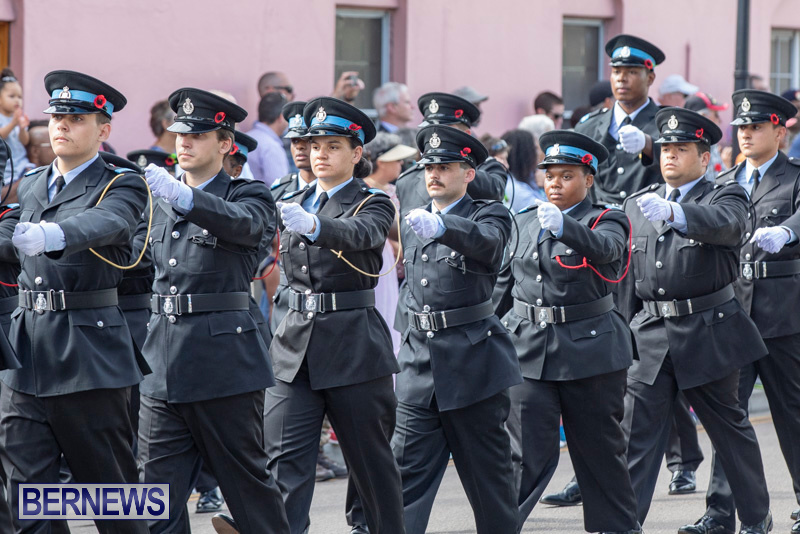 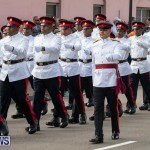 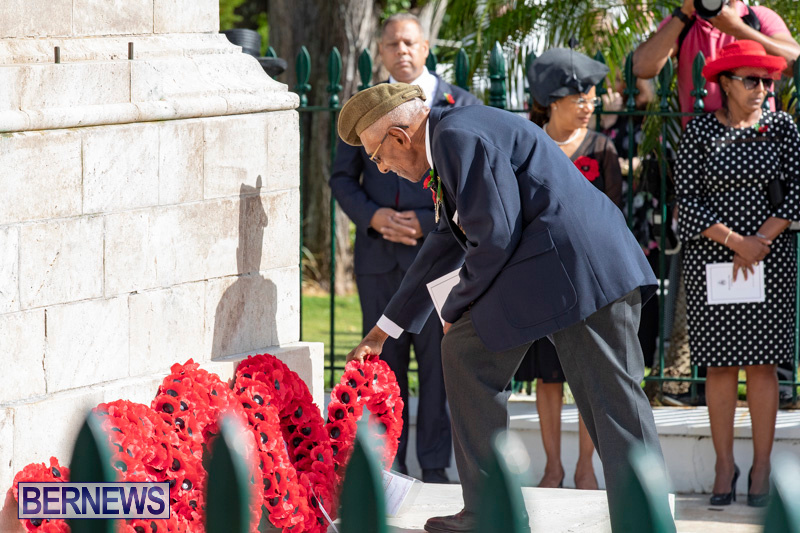 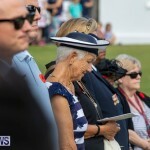 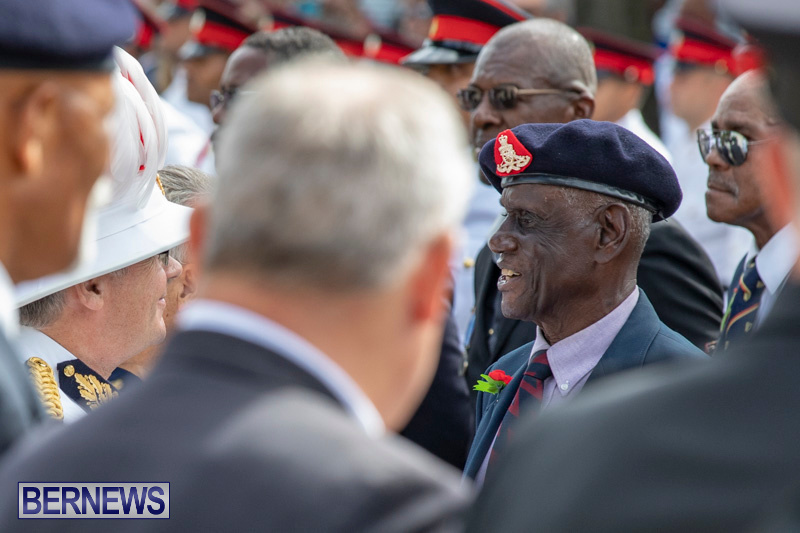 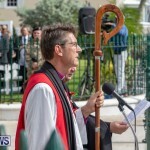 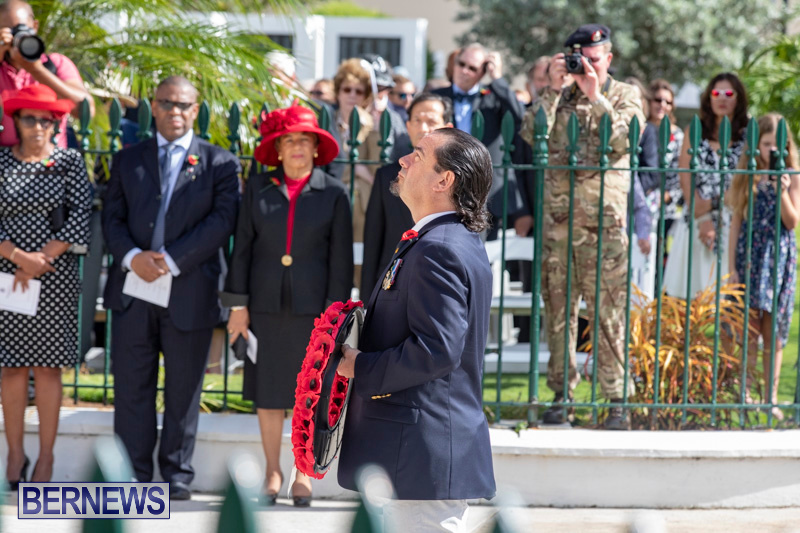 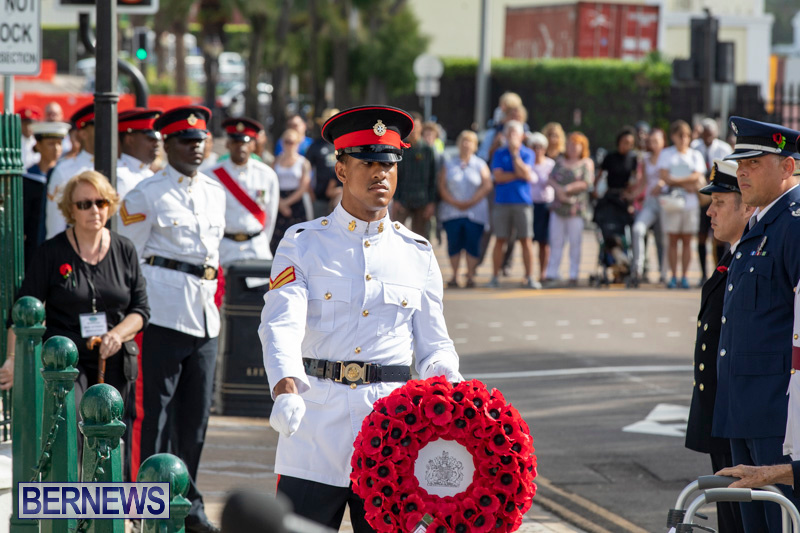 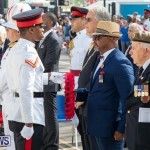 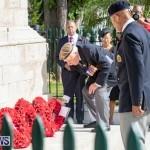 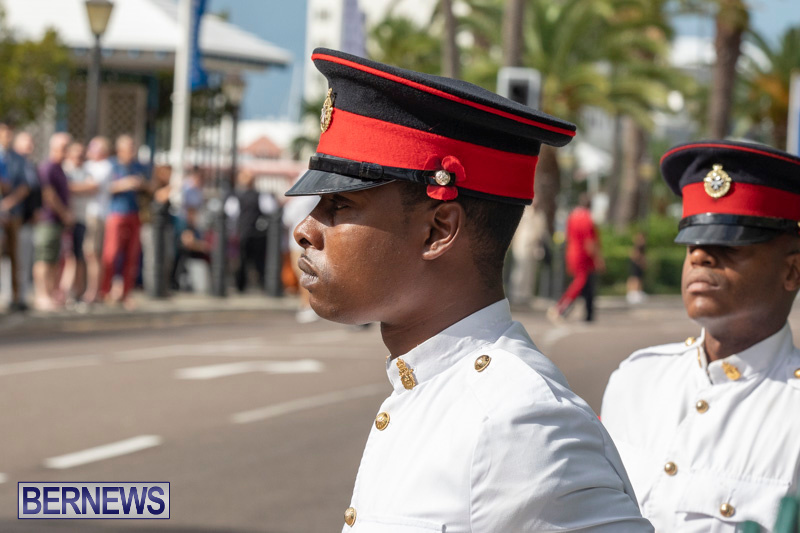 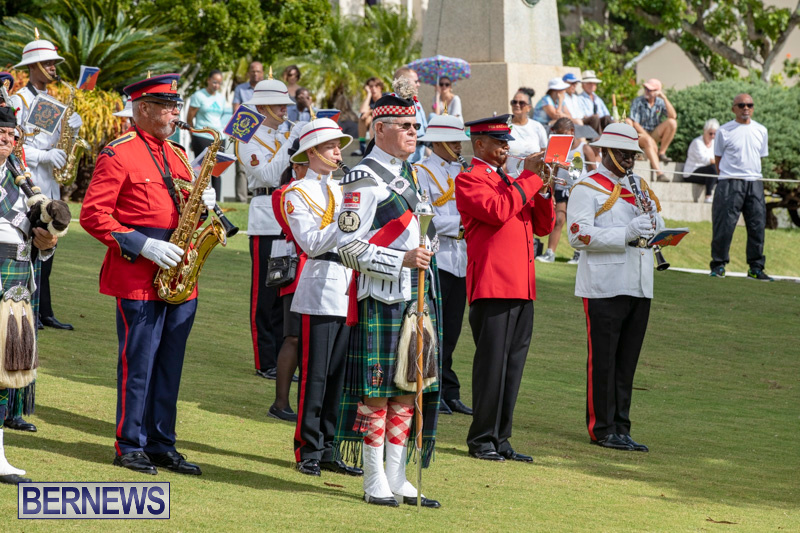 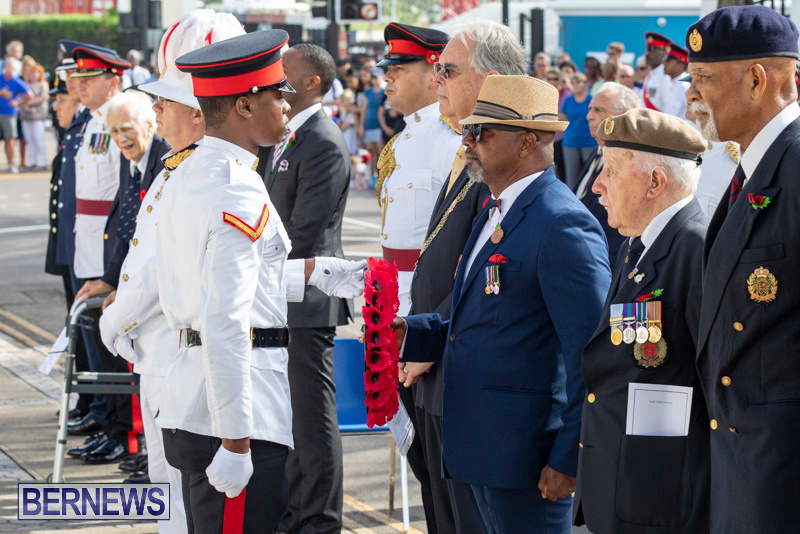 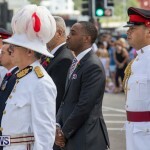 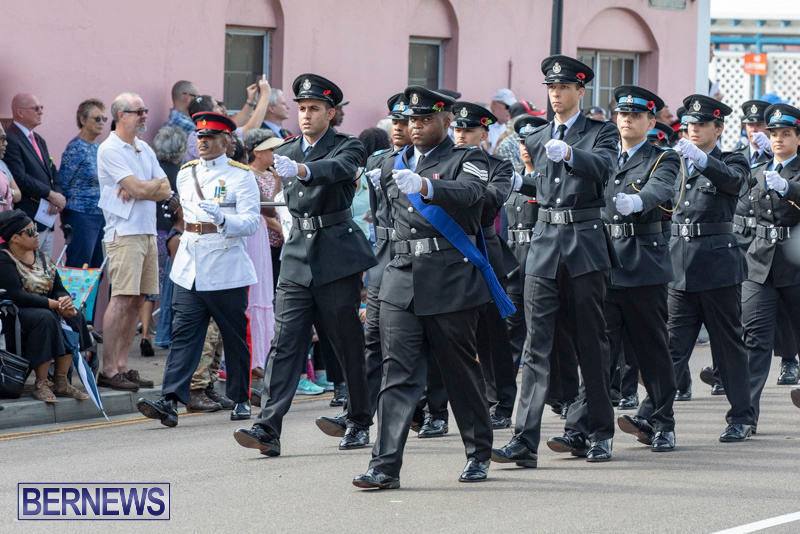 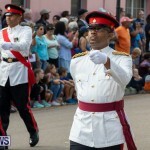 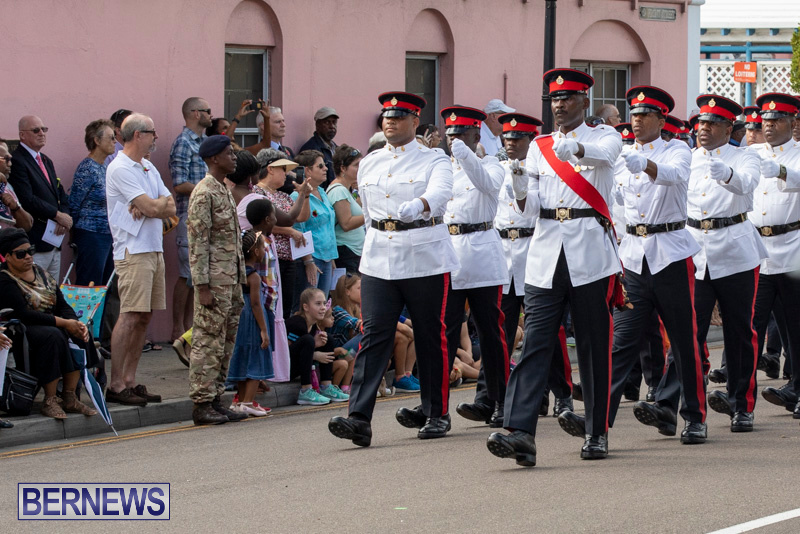 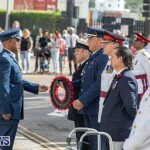 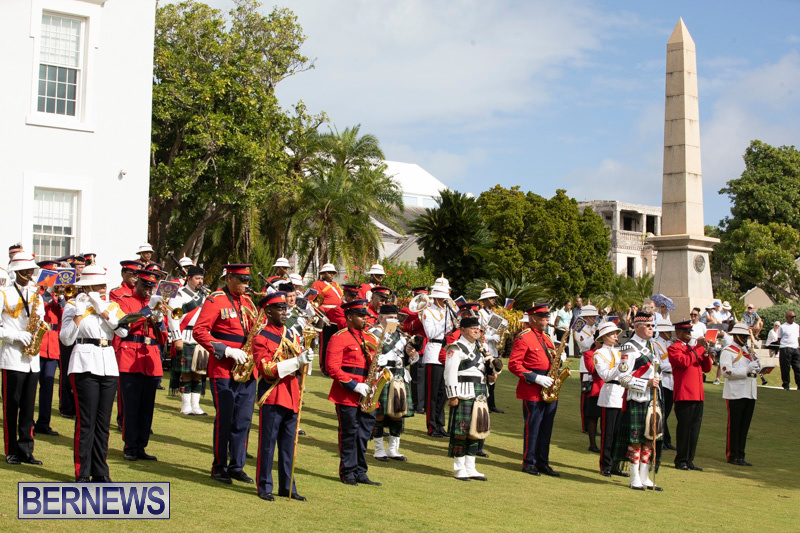 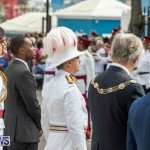 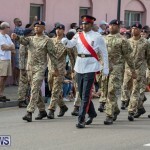 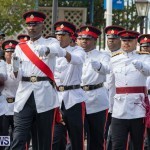 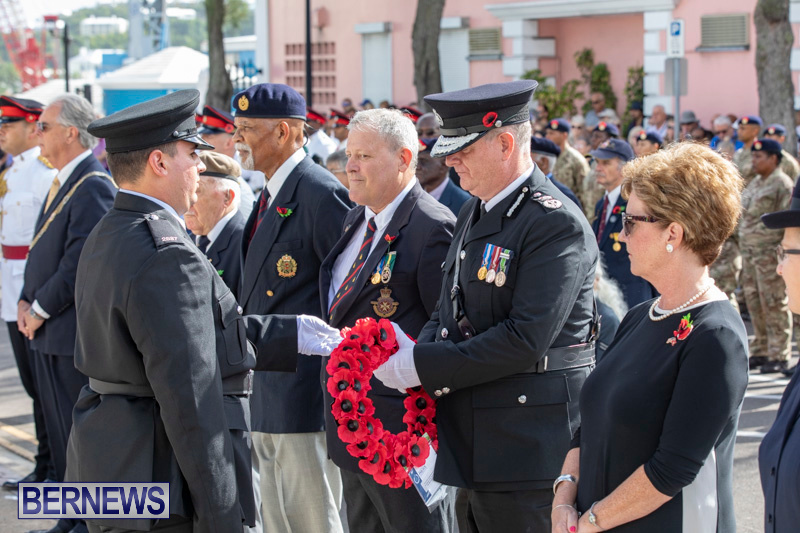 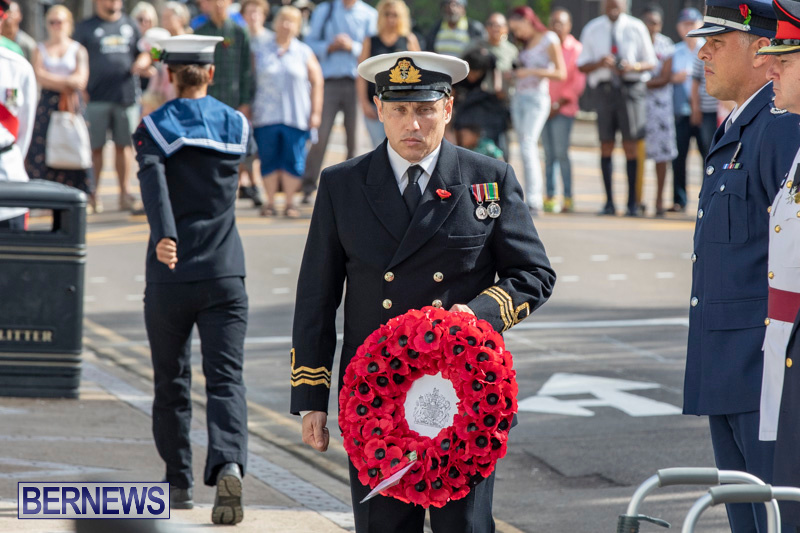 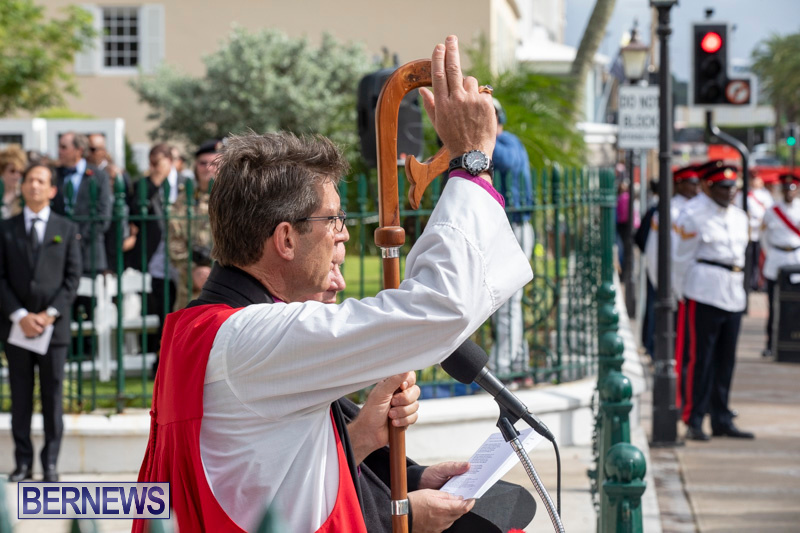 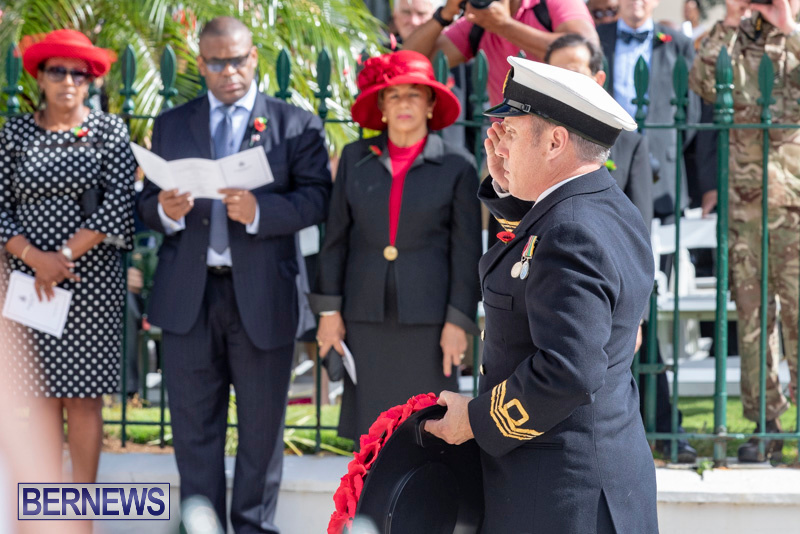 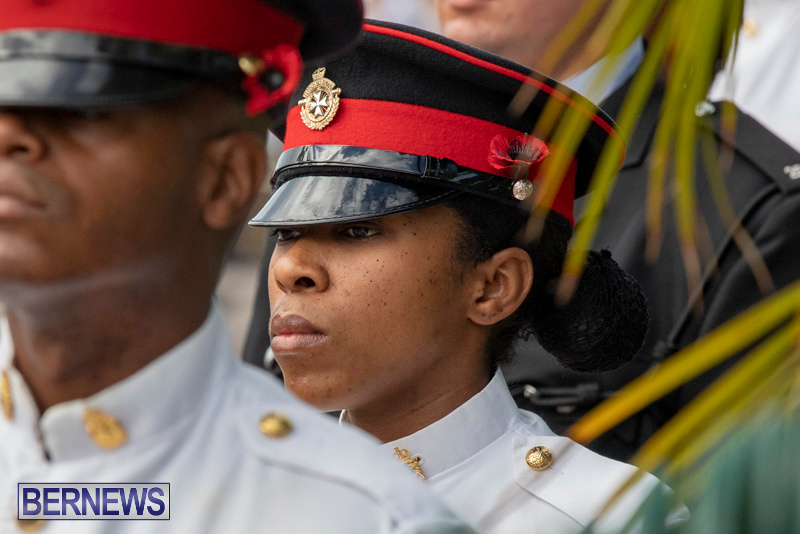 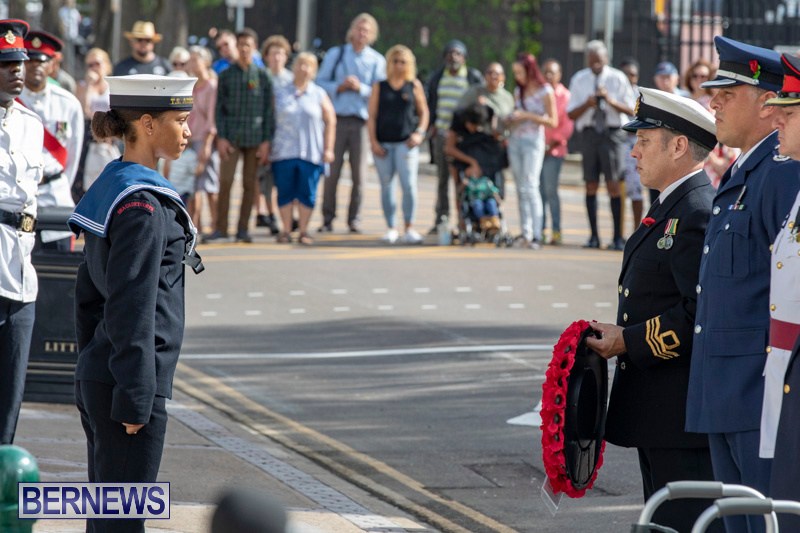 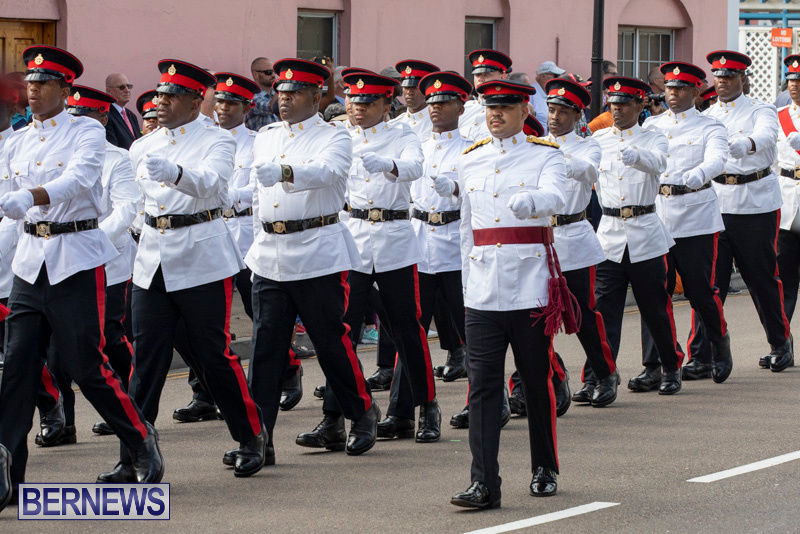 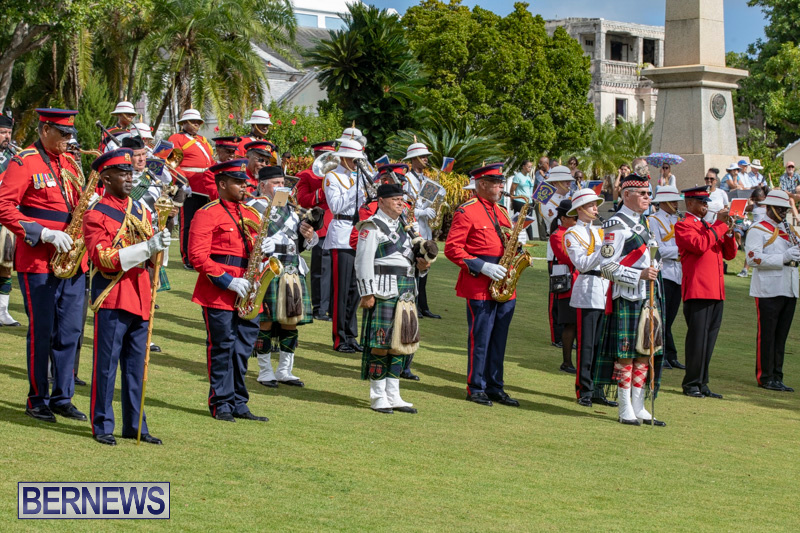 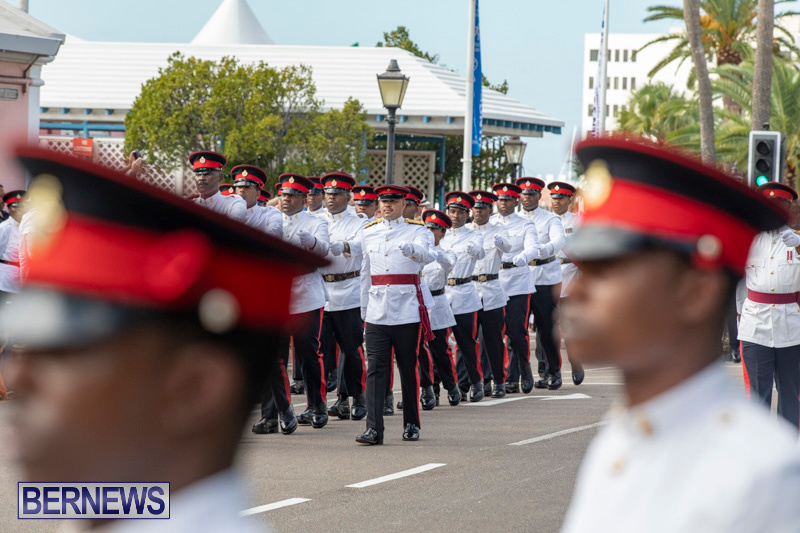 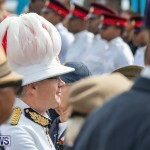 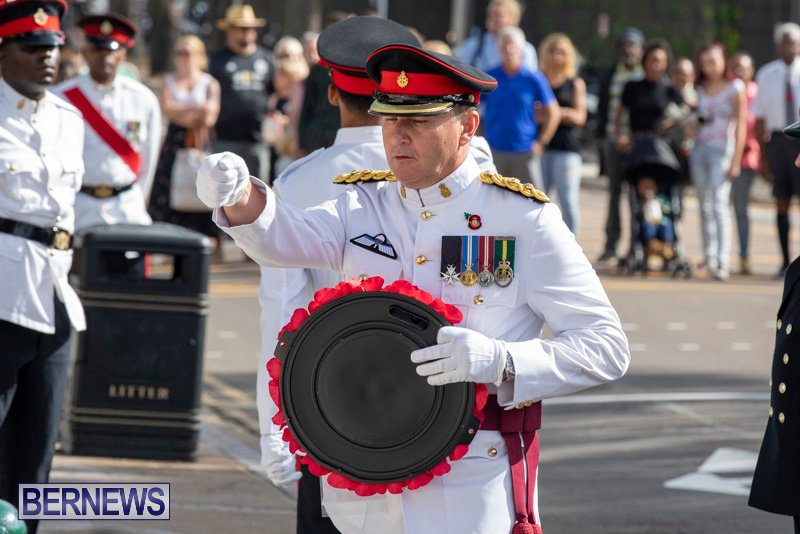 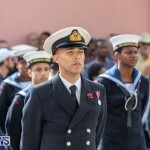 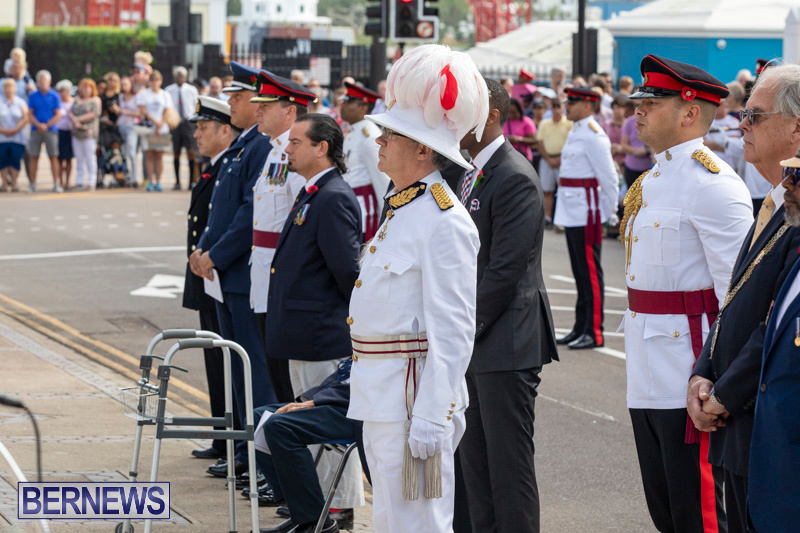 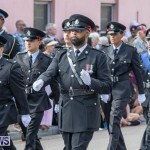 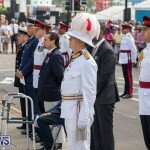 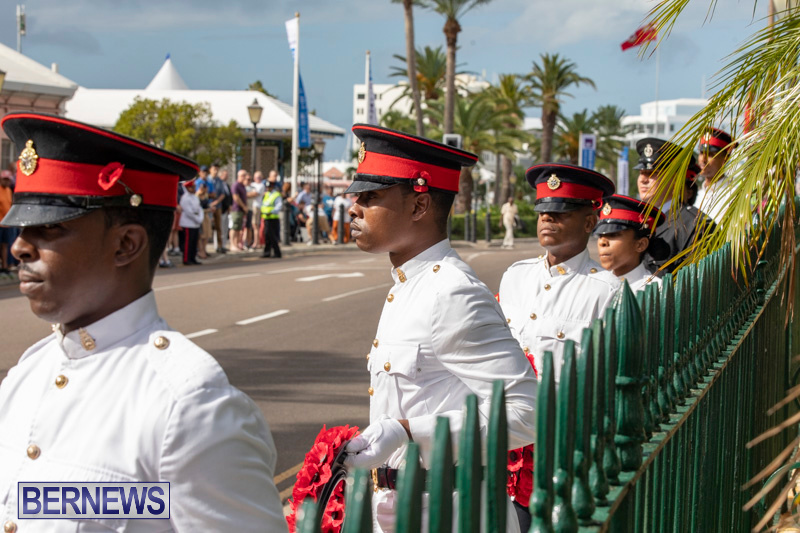 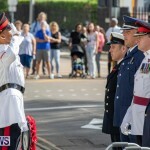 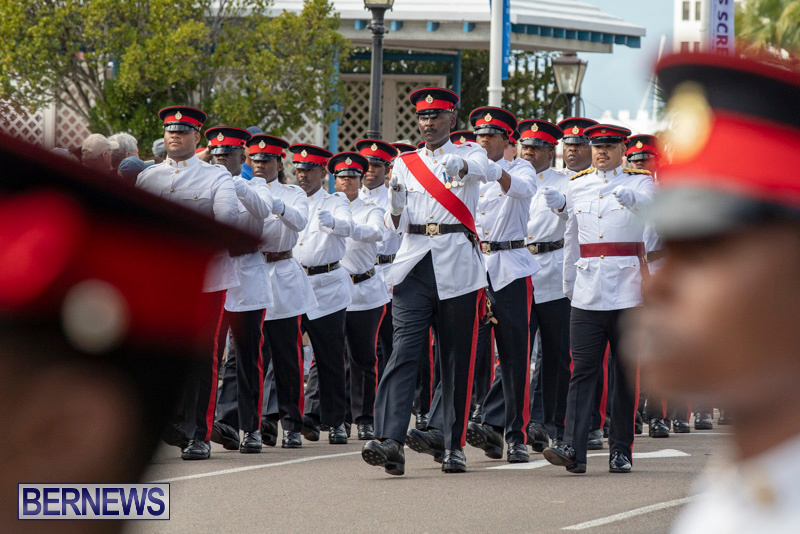 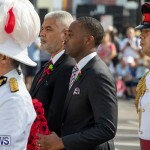 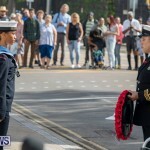 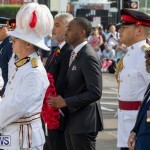 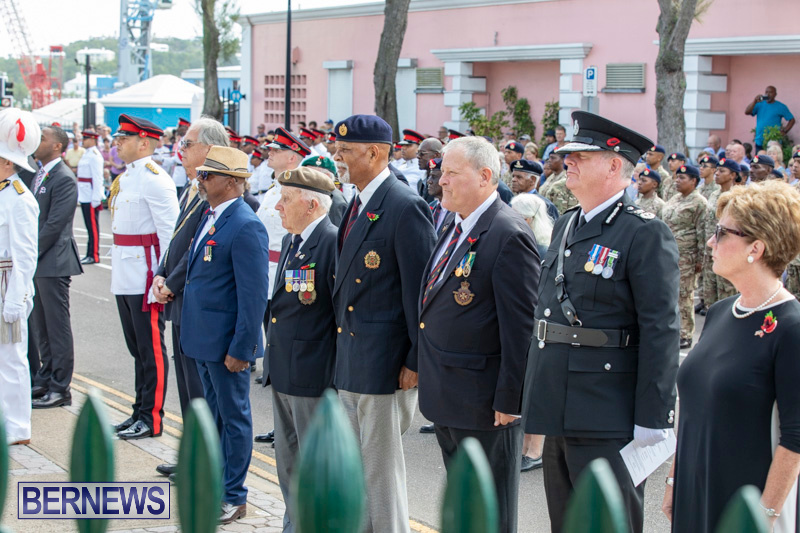 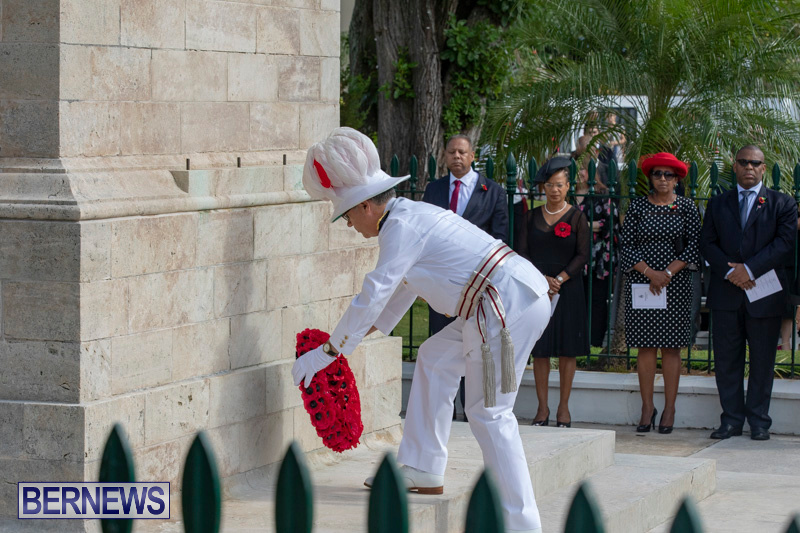 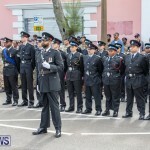 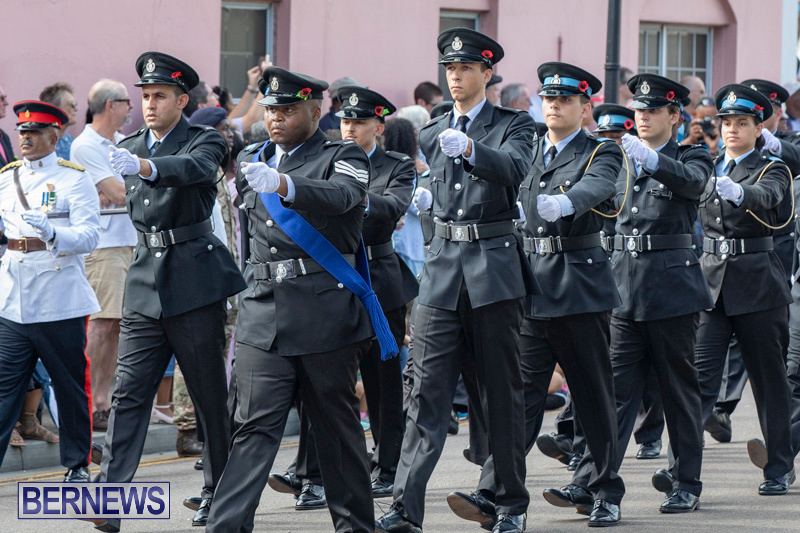 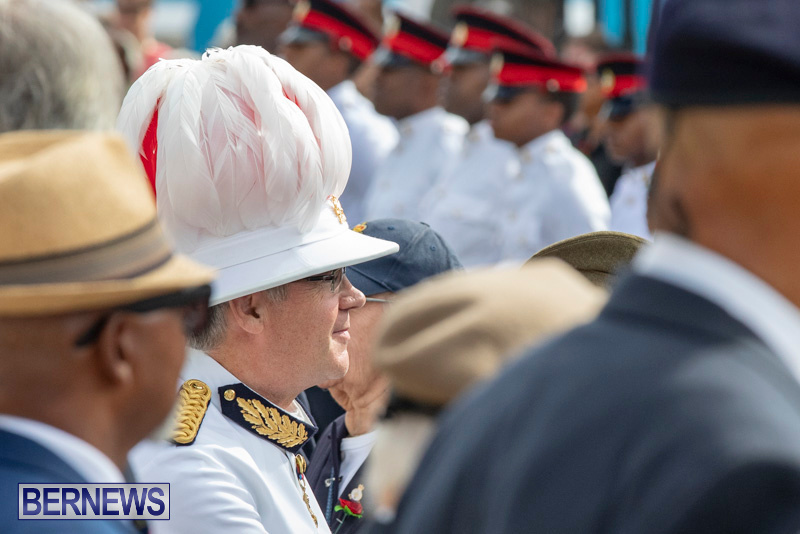 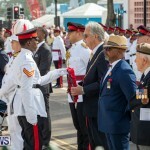 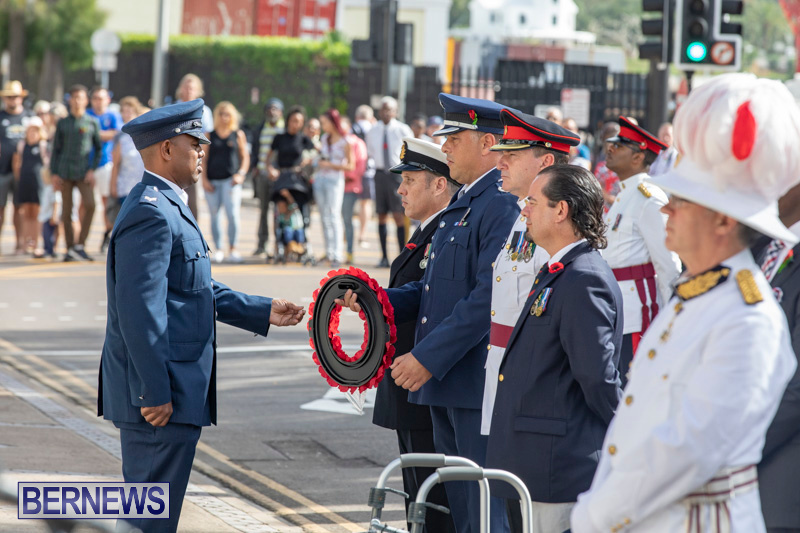 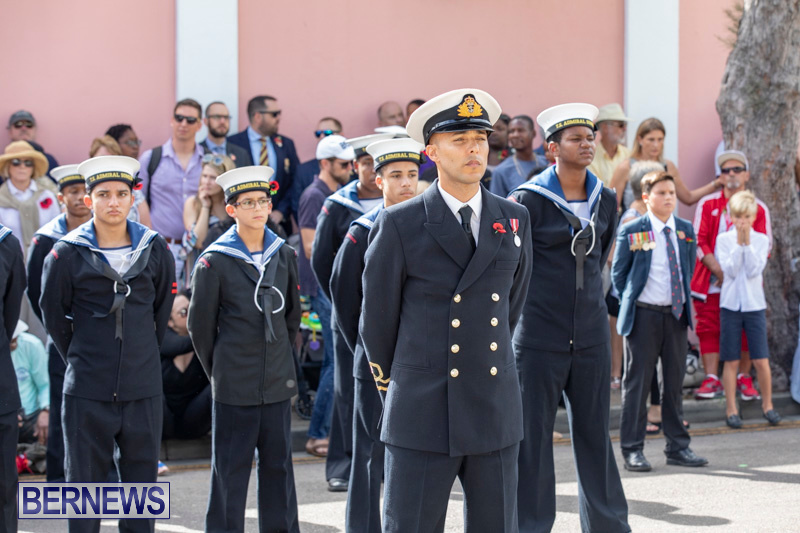 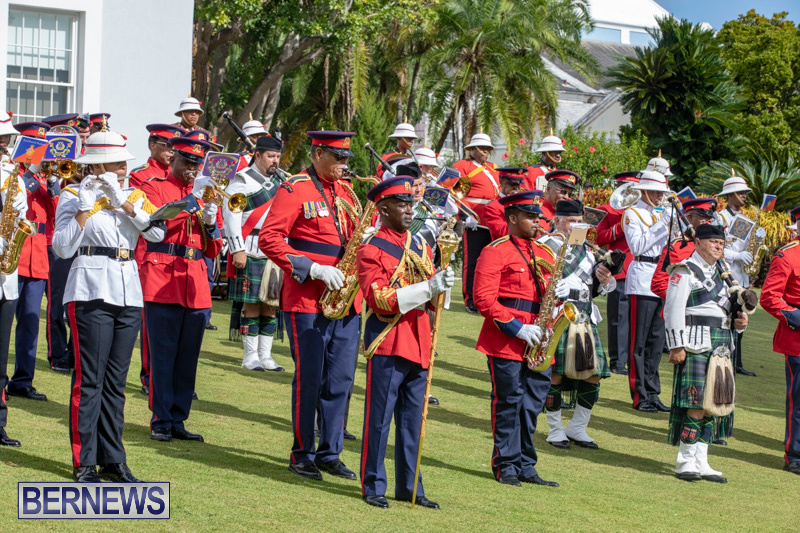 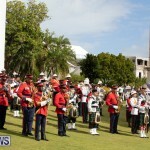 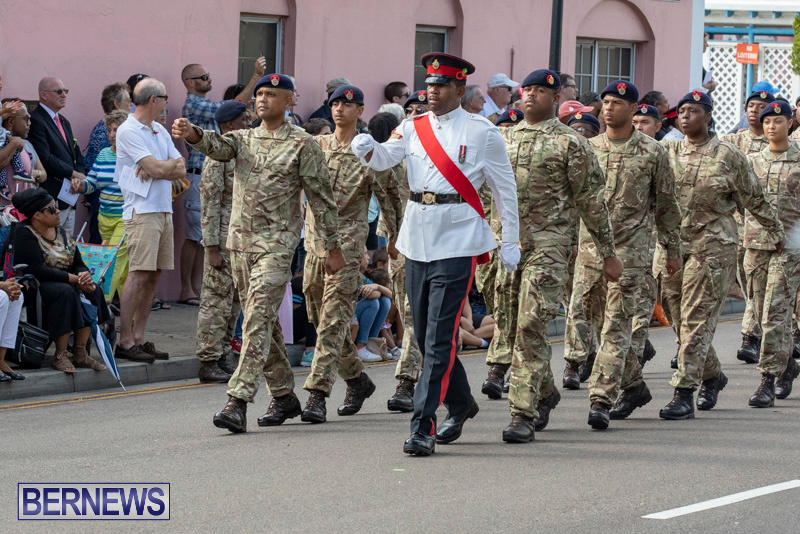 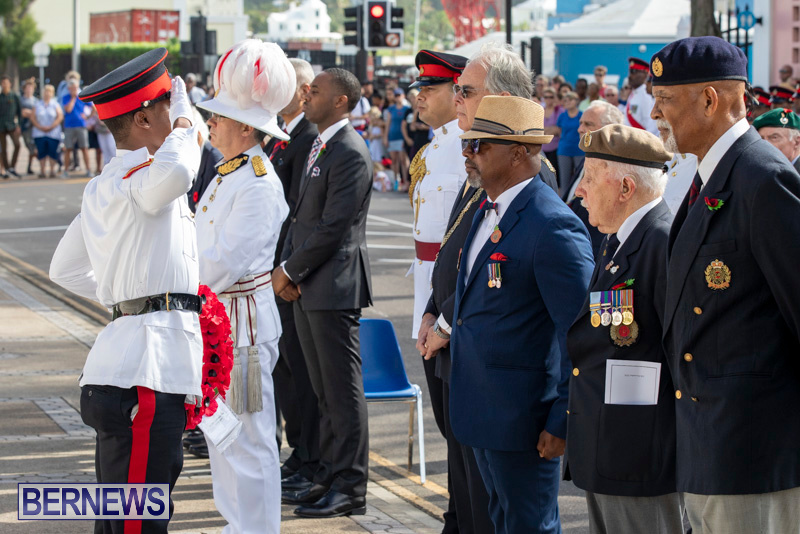 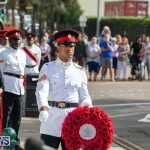 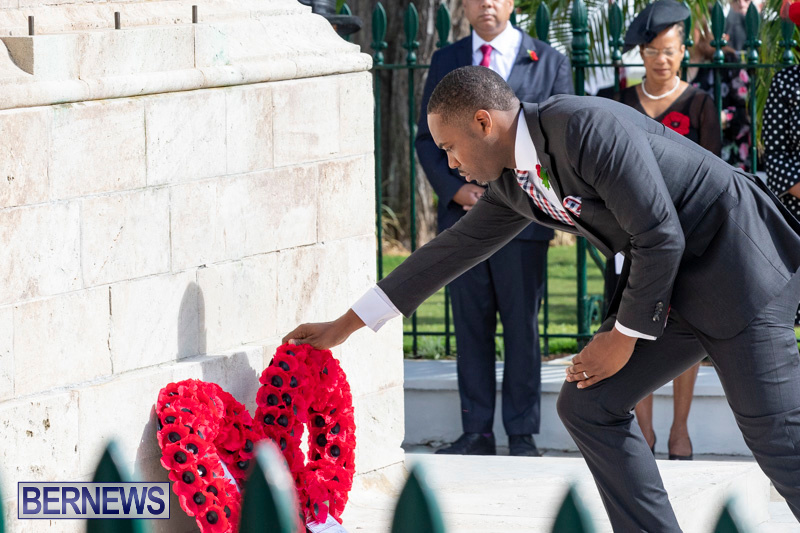 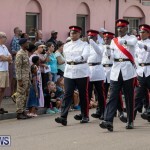 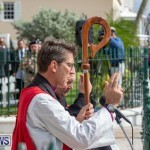 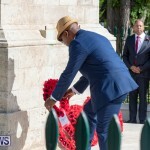 Those on Parade yesterday included the Royal Bermuda Regiment, Bermuda Police Service, Cadets and the island’s war veterans, who received the loudest applause of the morning. 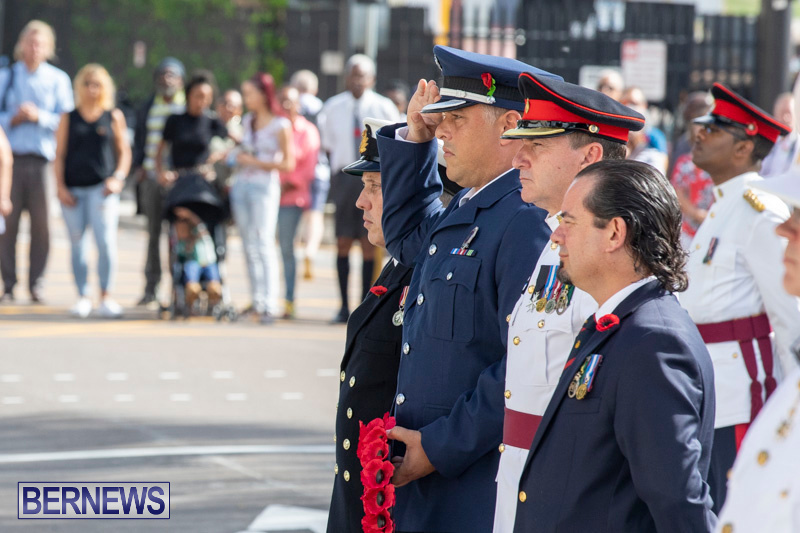 At exactly 11.00am, two minutes silence was held to commemorate the Armistice, which came into effect 100 years prior; at 11.00am on November 11, 1918. 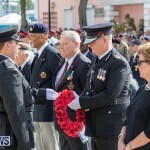 Wreaths were laid by Premier David Burt, Opposition Leader Craig Cannonier, Governor John Rankin, Hamilton Mayor Charles Gosling, as well as representatives from 1st Battalion Caribbean Regiment, War Veterans Association, Bermuda Militia Infantry, Bermuda Legion, Royal Bermuda Regiment, Defence Board, Bermuda Fire and Rescue Service, Bermuda Police Service, Sea Cadets, Salvation Army and the U.S. Consulate. 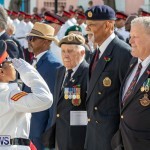 Between World War One [1914-1918] and World War Two [1939-1945], approximately 600 Bermudians served overseas, some of whom made the ultimate sacrifice and did not return home. 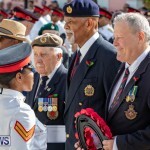 You can view our first set of photos and a video from the Remembrance Day Parade here, photos and video of the Wreath Laying at the War Memorial here, photos and videos of the Beacon Lighting Ceremony here, photos and videos of the St. George’s Remembrance Ceremony held last week here, and all our coverage of Remembrance Day here.